Hey guys! 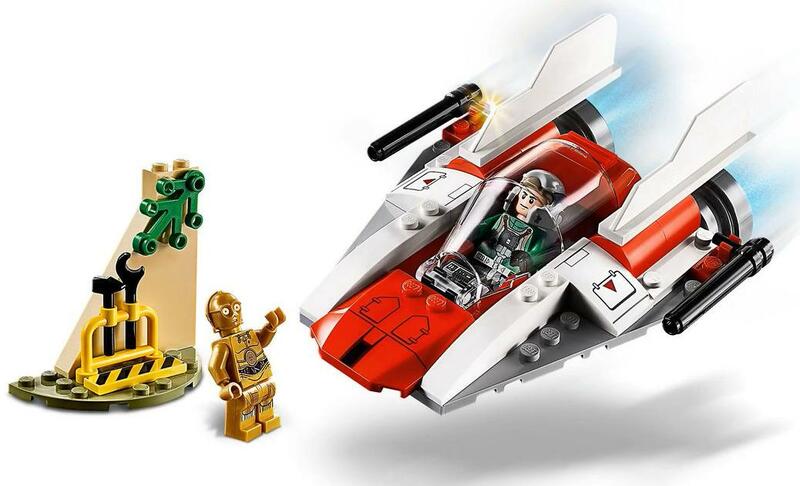 So official images of the LEGO Star Wars 2019 sets were finally revealed! Today, I’ll be taking a look at these upcoming sets and providing an analysis of them! Let’s begin! 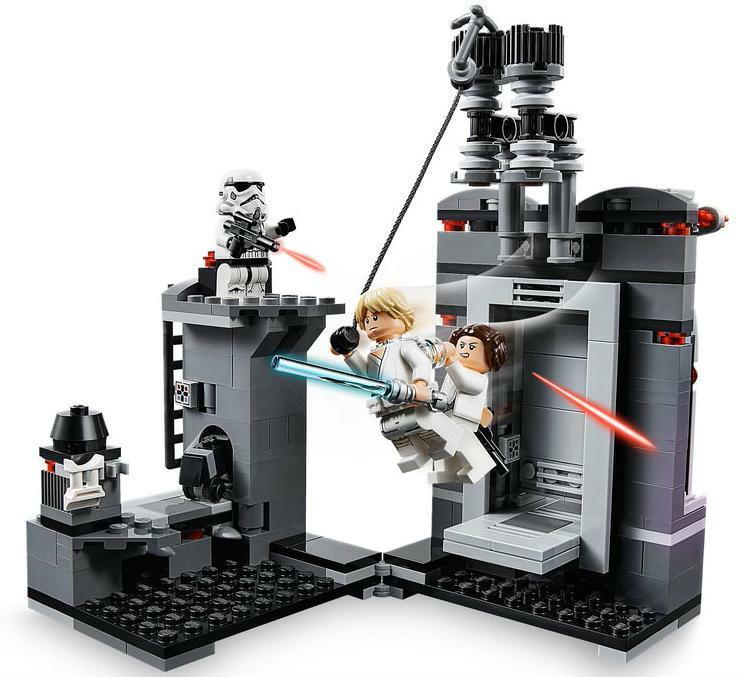 You may also want to check out our thoughts on the best 15 LEGO Star Wars sets ever made. 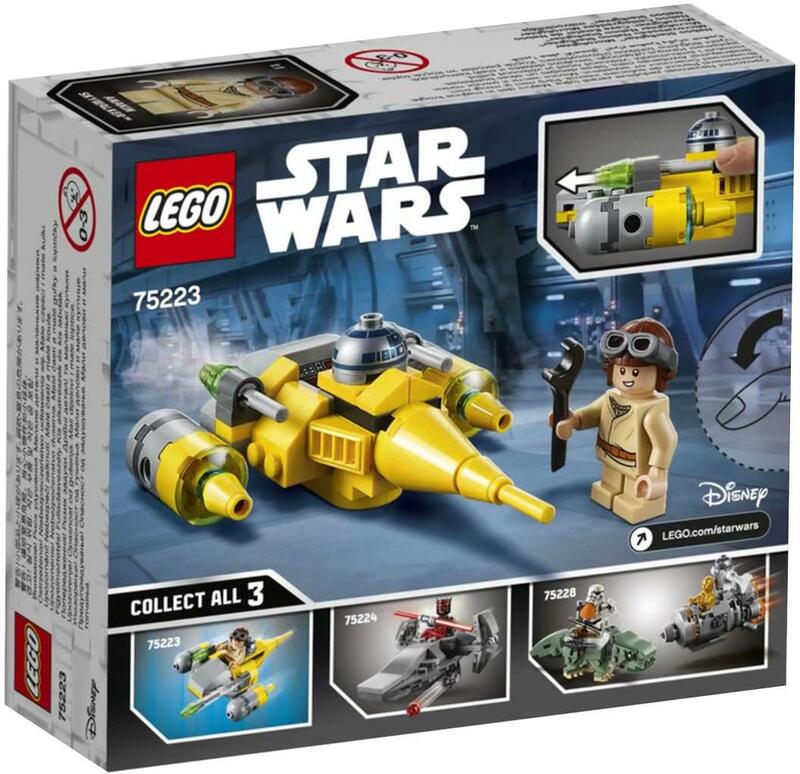 First up we have the smallest set of the wave, 75223 Naboo Starfighter Microfighter. This is one of two single microfighter sets. 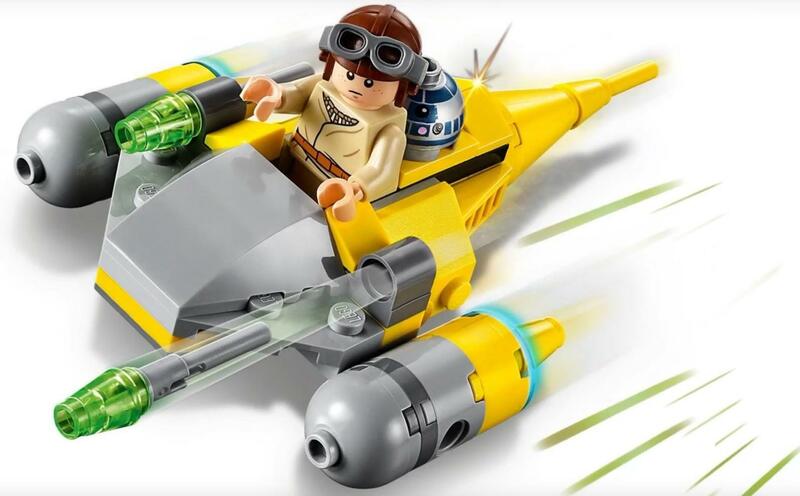 It comes with a yellow and grey mini Naboo Starfighter. I love the bulbous proportions of the craft – it looks suitably cute for the Microfighters line. It comes with a young Anakin Skywalker minifigure, who I think is adorable as well. I love that smile his face has! I just wish he came with a hairpiece too. The ship is armed with two flick-fire missiles. The missiles have translucent light green cone tips. There’s also a minifig R2-D2 head included on the Naboo Starfighter, which helps make it more comical and lighthearted. 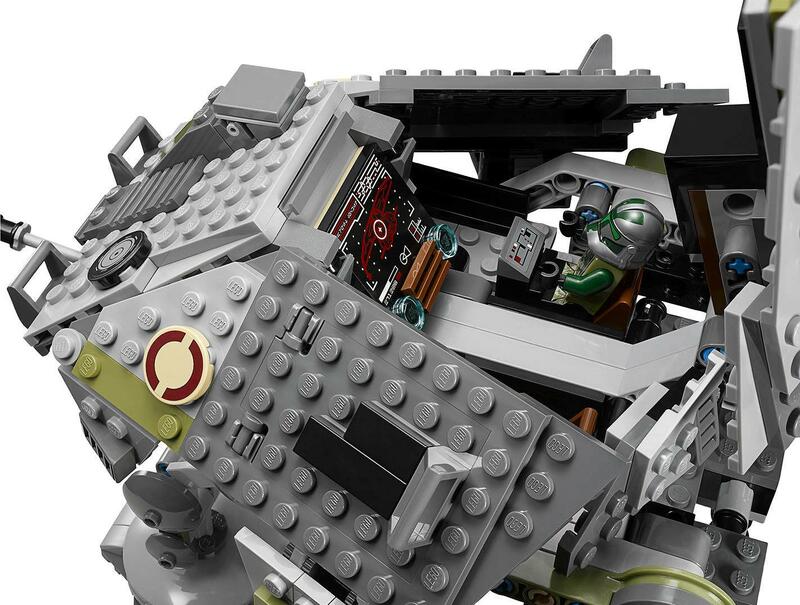 Overall, I think this is another strong addition to the microfighter lineup. 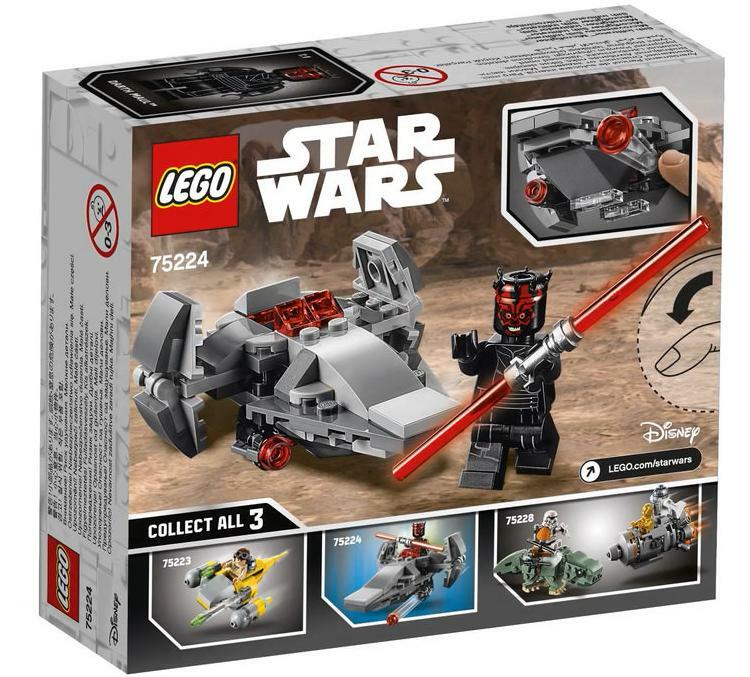 Next up in the first wave of 2019 LEGO Star Wars sets we have the other microfighter, 75224 Sith Infiltrator Microfighter. The minifigure included is the normal Darth Maul minifigure that first appeared in 2015, which looks pretty good except for the freaky smile printed on his face. 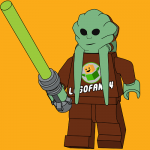 I hope that LEGO will update that minifigure’s head print someday as it’s just too goofy for my liking. 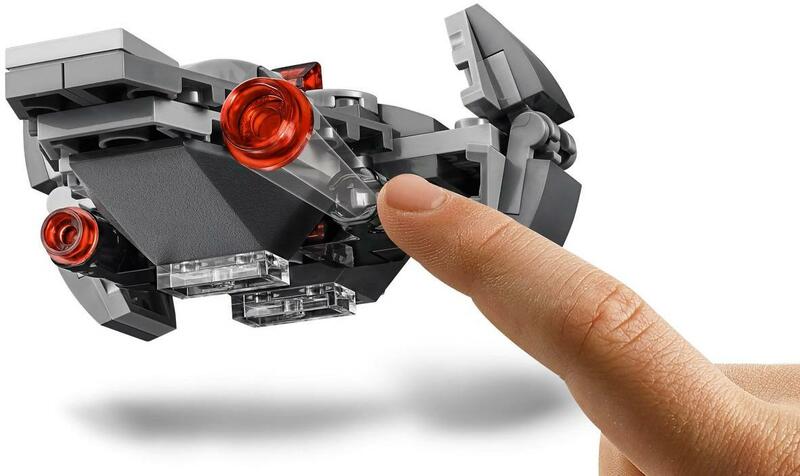 The Sith Infiltrator microfighter does look pretty decent to me, though. I like its bulbous, curvy shape of the nose, as well as the translucent red cheese slopes used for the cockpit. The random mix of dark grey and light grey does look a bit messy to me though. 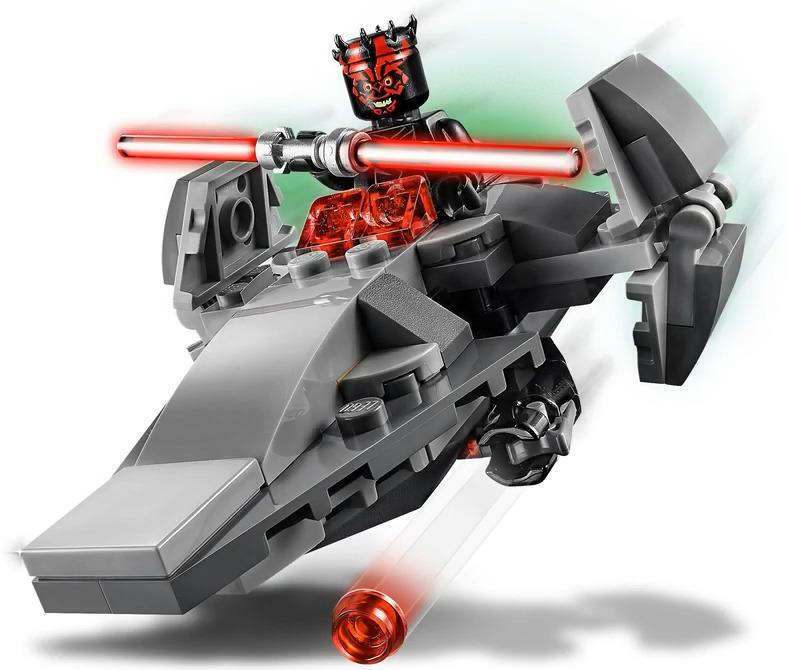 Just like any normal microfighter, the Darth Maul minifigure can be placed into the build to fly it around. Darth Maul can still wield his double-sided lightsaber, even when flying his ship, though I would not recommend is as that can be pretty dangerous! There are a pair of clear 1×2 plates at the base of the microfighter to prop it up and make it look like it’s hovering when you place it on a flat surface. There are also a pair of stud shooters for added firepower. 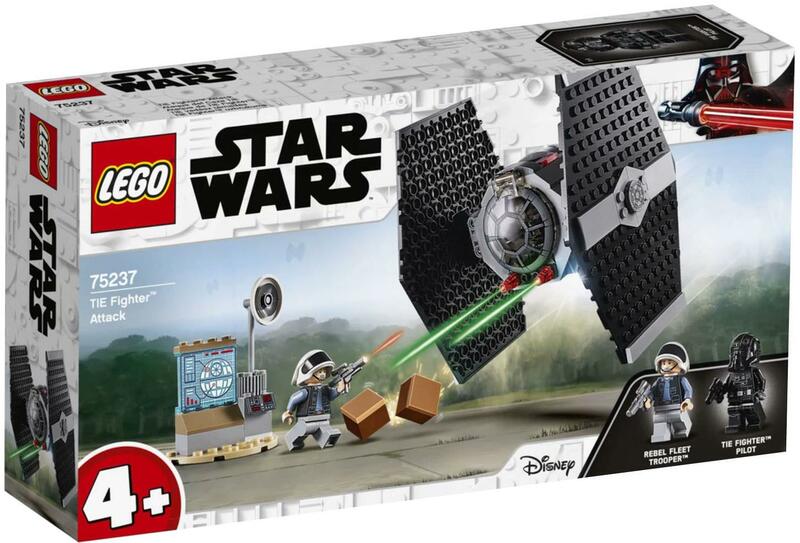 Overall, this is another pretty good addition to the LEGO Star Wars Microfighter line. 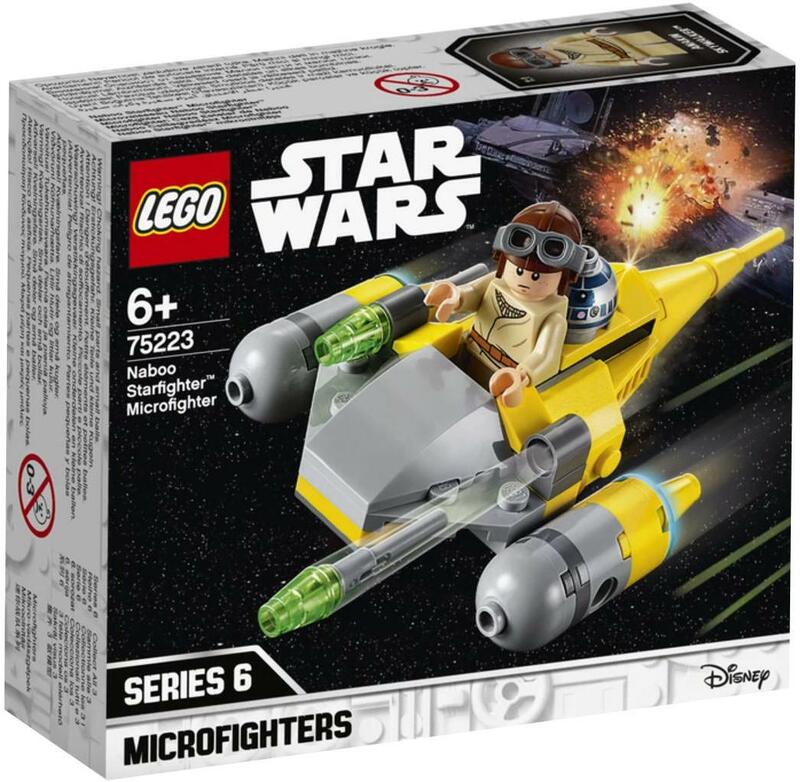 If you like microfighters, this should be a pretty worthy purchase. 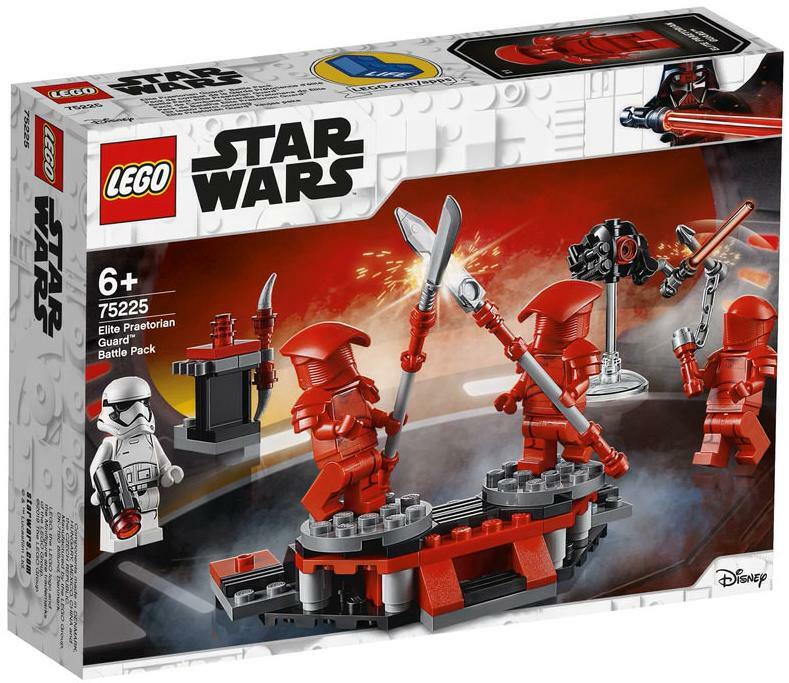 Up next is one of the two battle packs that have been revealed so far, 75225 Elite Praetorian Guard Battle Pack. The set comes with three Elite Praetorian Guards and one First Order Stormtrooper. The Stormtrooper is mostly the same as the stormtrooper figures we’ve gotten before, just that he has the Episode VIII style of stormtrooper helmet (with the thinner mouth). Two of the Elite Praetorian Guards have the same new helmet, which has a flat visor that covers the helmet. I like this new piece but it does look pretty oversized to me which is disappointing. 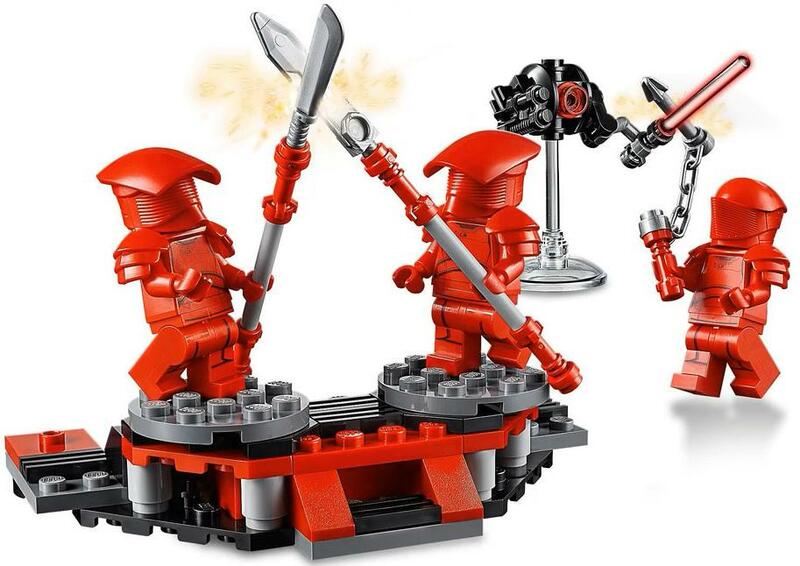 The final Elite Praetorian Guard minifigure is almost the same as the one in 75216 Snoke’s Throne Room, just that he has printed legs instead of the robe piece. The build in the set is a training area for the Elite Praetorian Guards (which is ironic as they were beaten by a girl with little or no lightsaber training). It’s a pretty small and simple build, and looks a bit too rudimentary for my liking. There’s also a battle drone (with blaster and lightsaber) mounted on a clear stand, along with a detachable weapons rack with extra weapons for the Praetorian Guards. These can be detached from the base and moved around if you wish. 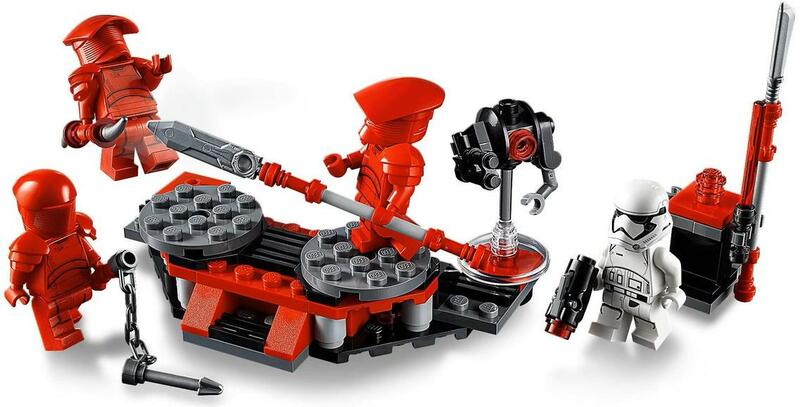 There’s only one play feature involved in the build – you can put the Praetorian Guard minifigures on the turntables and rotate the turntables to make the guards “fight”. It’s the most basic of play features and is a bit boring. Ultimately, the build in this set is pretty lame if you ask me. 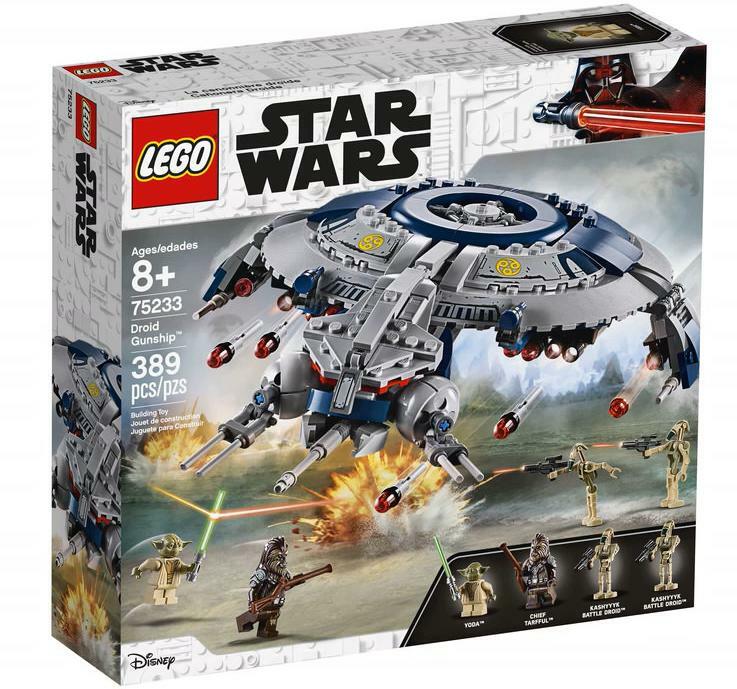 However, the minifigure selection is a huge draw and LEGO knows it – basically 99% of the people who buy this 2019 LEGO Star Wars set will buy it for the figures. And ultimately, whether or not you get this set depends on whether or not you like the figures – do you? 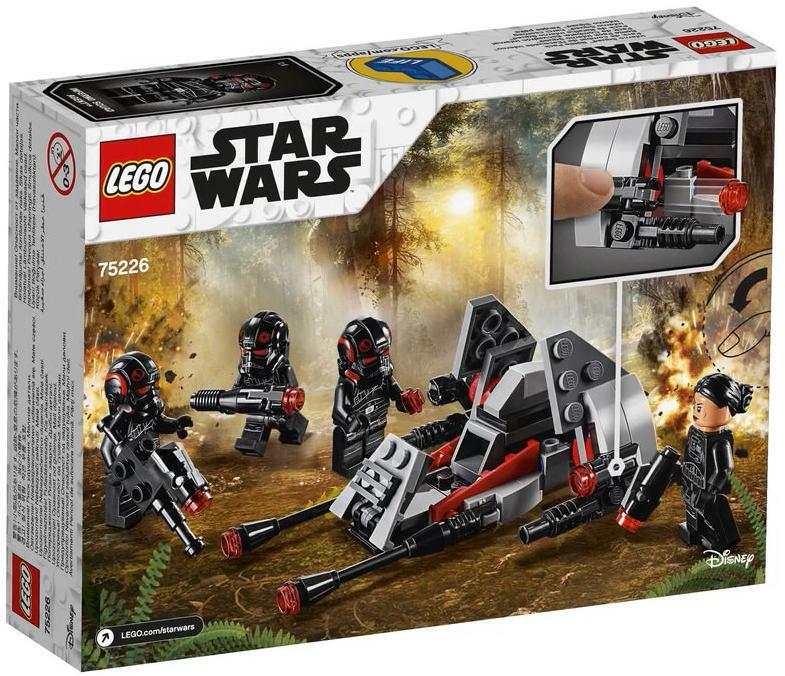 Up next is the other battle pack, 75226 Inferno Squad Battle Pack. This set is based on the Star Wars Battlefront II campaign and is probably my favorite set from the upcoming wave. 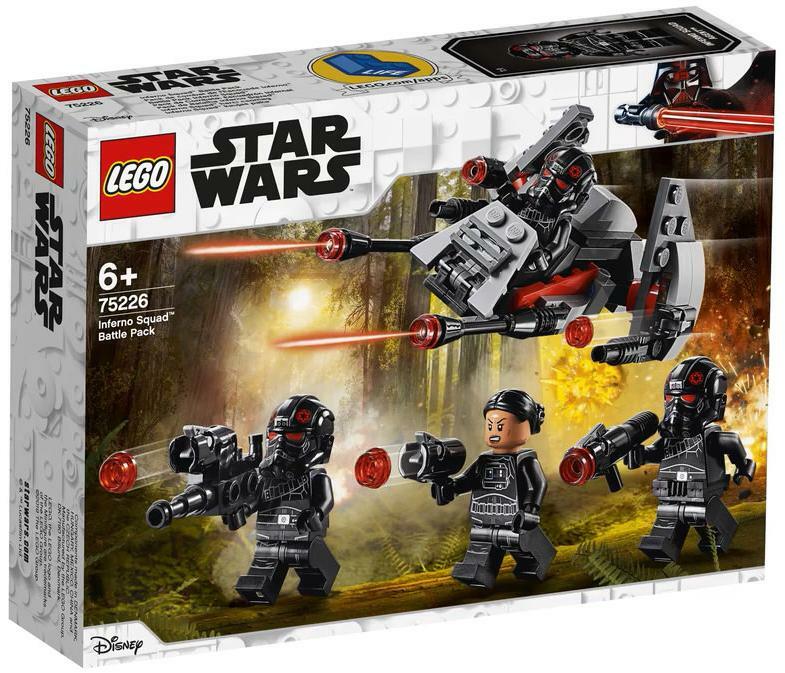 The set comes with three Inferno Squad troopers and an Iden Versio minifigure, making for an awesome minifigure selection. They wield stud shooters but I do like how there is some variation in between the weapons. Iden Versio uses the 2013 Padme hairpiece in black, which is a great reuse. 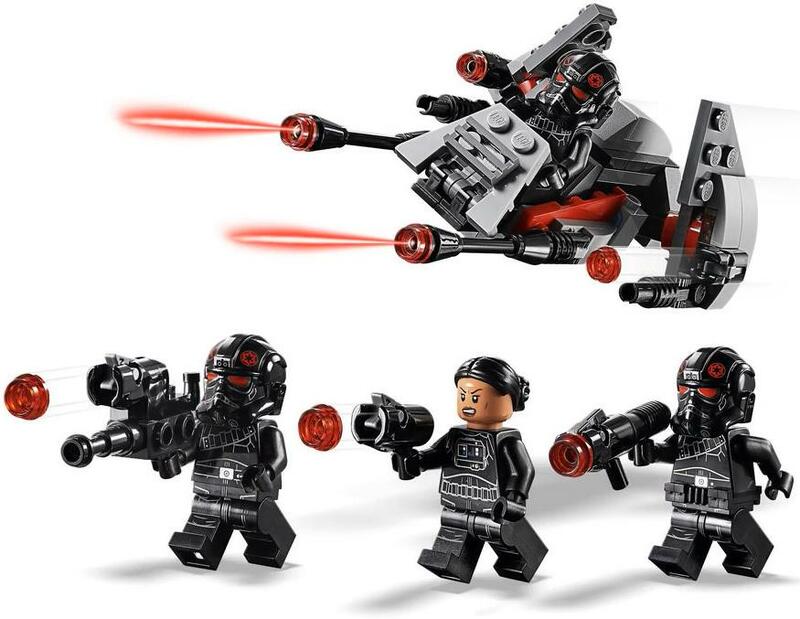 I also like the Inferno Squad helmets, and if you look closely, one of the Inferno Squad troops has a black utility belt (initially from the LEGO Batman Movie theme)! The build is a small little speeder that has a seat for one trooper. It has several cannons and two stud shooters. The speeder looks decent, but it’s pretty darn small which is disappointing as the set doesn’t feel super worth it with such a small build. 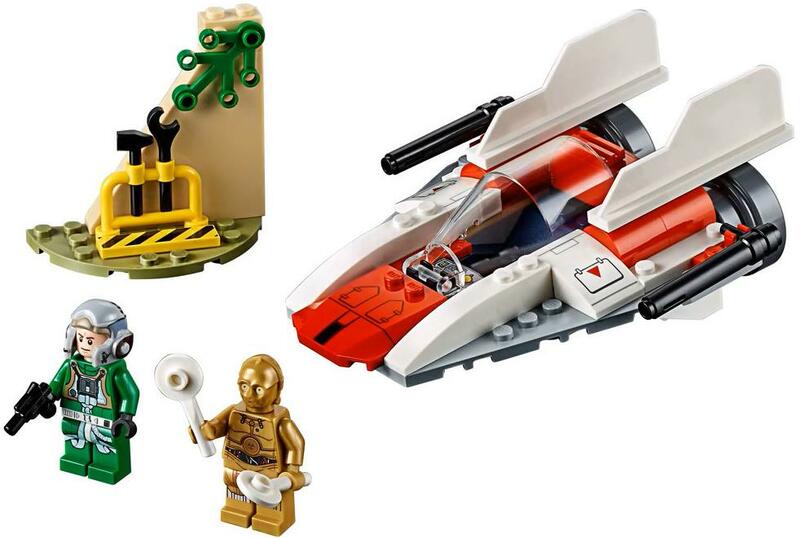 Nevertheless, I think the awesome minifigures save this set, and I am definitely very excited for it! 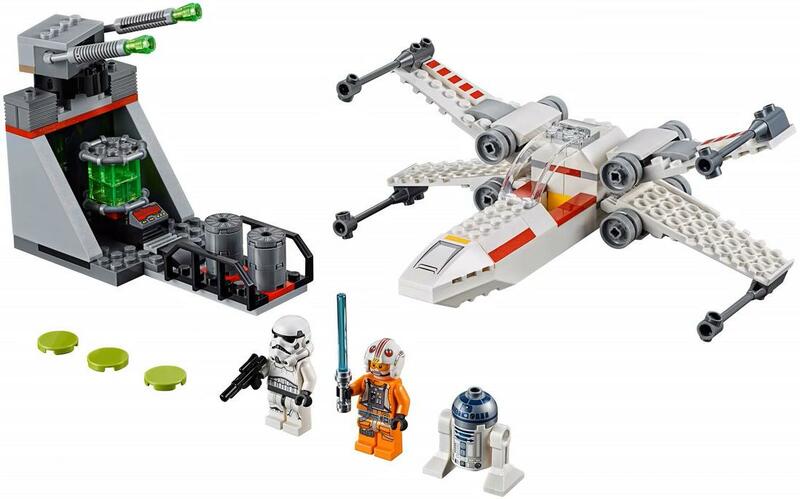 If you’re wondering why the 2019 LEGO Star Wars set numbers have some gaps in them, it’s because the full range hasn’t been revealed yet, meaning we still have some more juicy sets we haven’t seen. 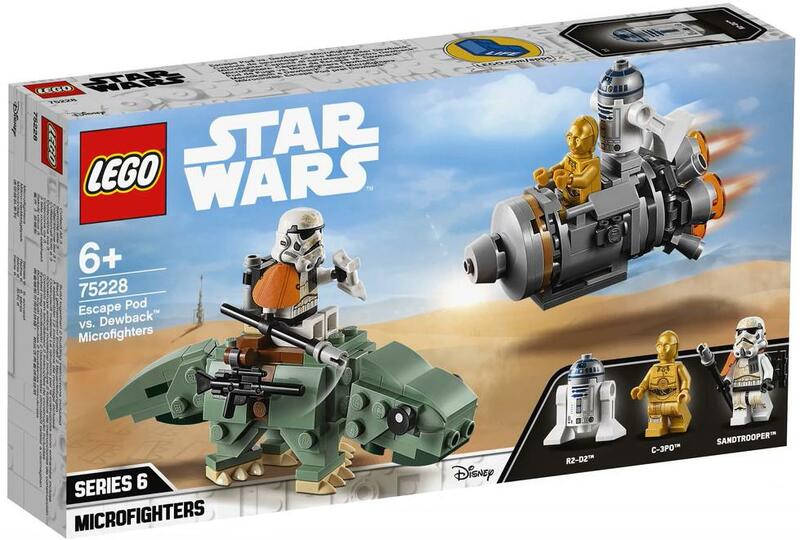 Anyway, this is the only microfighter dual pack coming out in 2019 – 75228 Escape Pod vs. Dewback Microfighters! 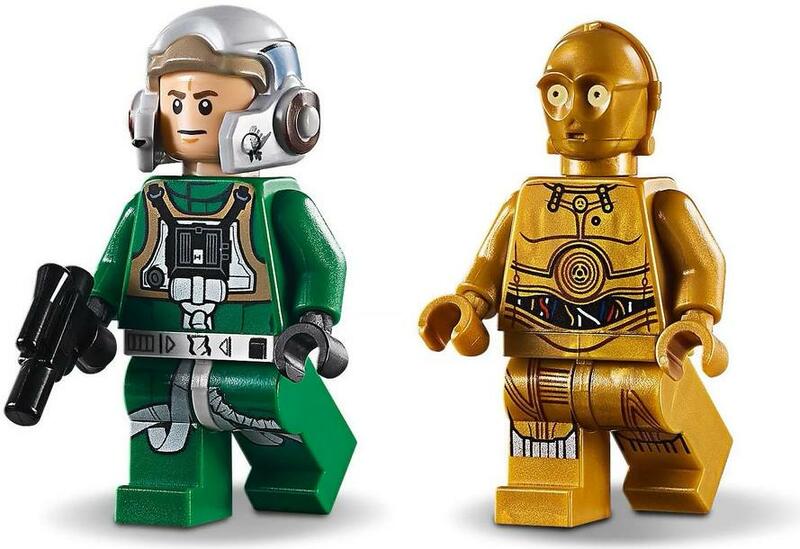 There are three minifigures included in the set – R2-D2, C-3PO, and a Sandtrooper. Threepio and Artoo are the same figures that we’ve been getting for a while, but the Sandtrooper has been updated to use the new, bigger stormtrooper helmet that first appeared in the Solo sets. I do not like this new helmet and I firmly believe that the previous helmets were better, in both accuracy and size. 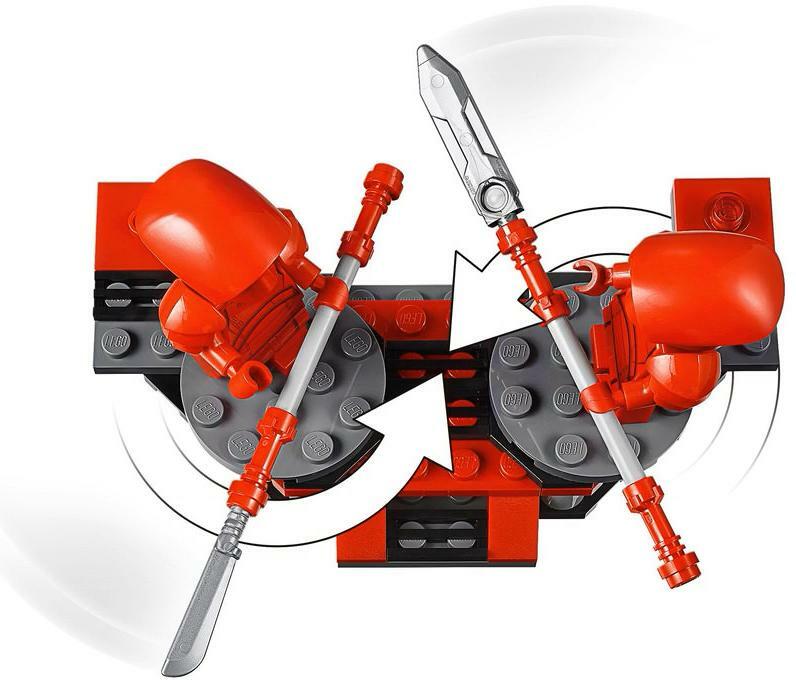 Nonetheless, it looks like LEGO has fully committed to using this newer helmet mold, which disappoints me. Now normally I’m not the biggest fan of microfighters, but I must say that the builds in this set are pretty cool. 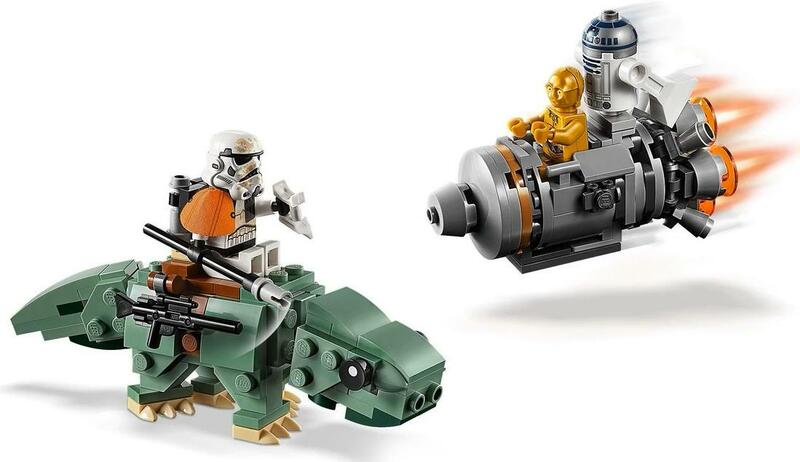 It’s a microfighter escape pod vs a microfighter dewback – a very unique and innovative choice! The escape pod is pretty small but you can fit both C-3PO and R2-D2 onto it, and it does have nice details like the four engines at the back. The Dewback has cute beady eyes and a sand green color scheme. Its head and tail are mounted on ball joints so can be posed as you wish, while the feet can be rotated side-to-side. There is also a brown saddle with a seat for the Sandtrooper and two clips for accessories. 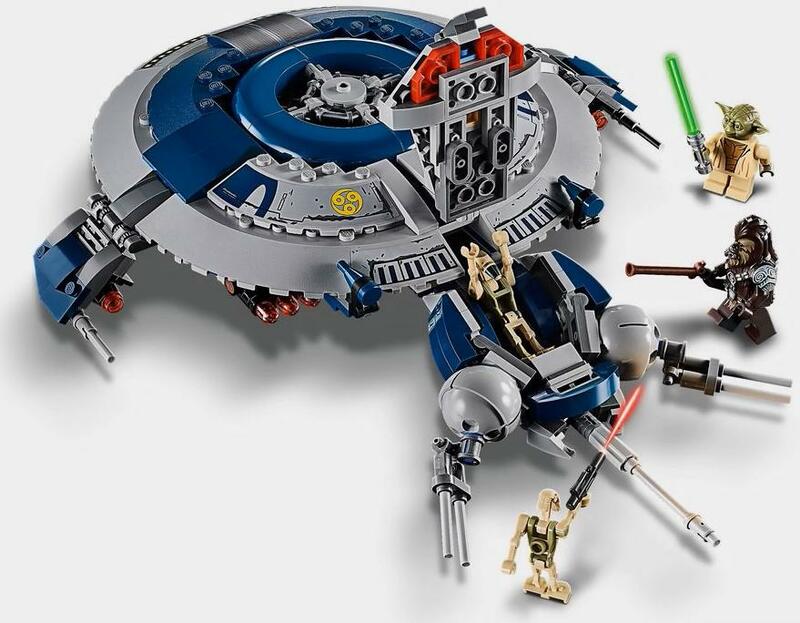 Like I previously mentioned, I’m not usually a big fan of microfighters, but this is a pretty unique and clever set so I might pick it up when it comes out. The builds are a little bit small for my liking though – hopefully it’s not too expensive. Moving on, here we have 75229 Death Star Escape. I anticipate this set will retail for $29.99 USD, which is the normal price for sets at this size and/or price point. 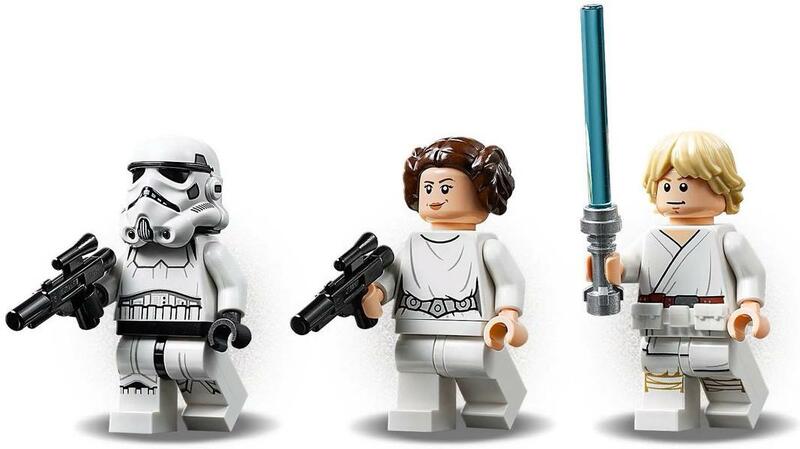 There are three minifigures included in the set: a Stormtrooper, with the ugly new helmet; Princess Leia, with a nice new double-sided head print; and Luke Skywalker, who’s the same as before except he now has a new white utility belt piece (which I personally think looks a bit weird). …or it can be hinged closer to form a square footprint. 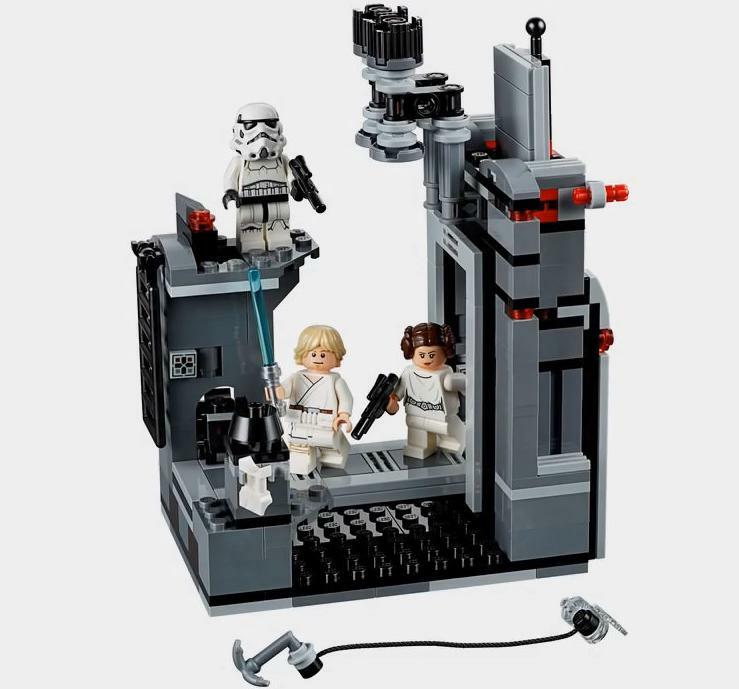 There are several details like a rotating weapons rack, a raised observation post for the Stormtrooper, a hole for the Mouse Droid, and an extendable bridge for Luke and Leia to walk across. Luke gets a grappling hook that you can hook onto the pipes above. I am disappointed, though, that there is no mechanism to actually launch them across. Luke also has a clear neck brace that lets Leia grab onto him. There’s also a sliding door that opens vertically, just like in the movie. 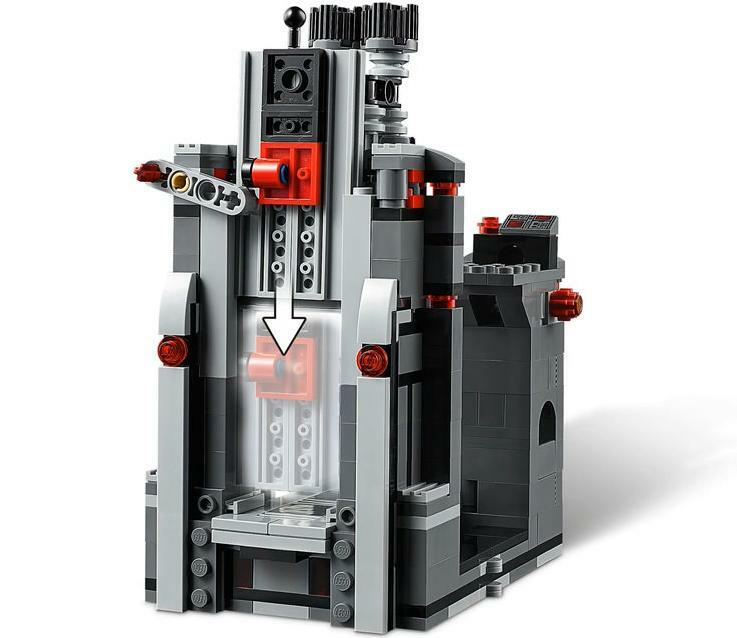 You can open it and lock it with a Technic beam, or let it drop into the closed position. 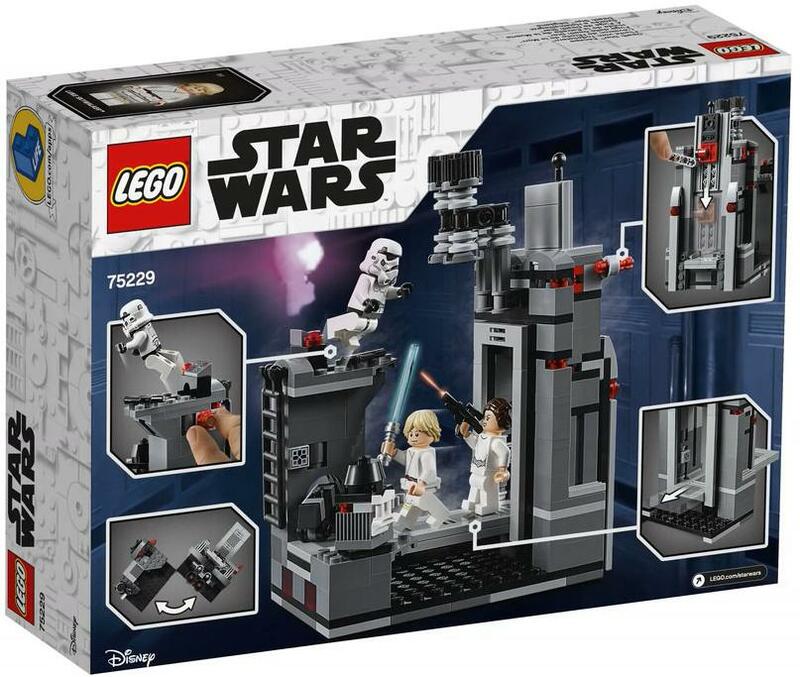 Ultimately, I think quite a few will get this set for the Luke and Leia figures, but I’m not a big fan of the set. I think the build looks quite blocky and it’s not that interesting, and I don’t care too much for the figures (apart from Leia’s new head print). 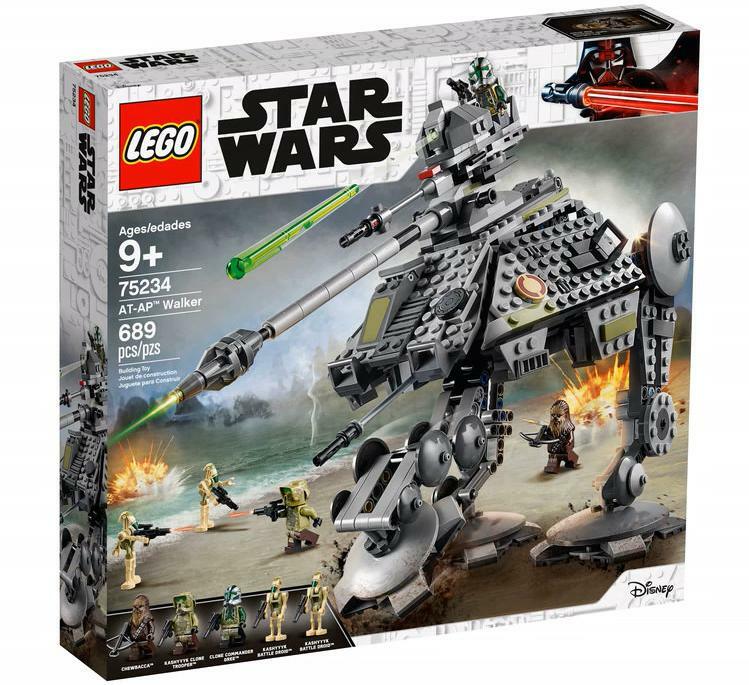 We seem to have encountered a leap in the LEGO set numbers, with the next set being 75233 Droid Gunship. It has 389 pieces and I think it will retail for $49.99 USD. 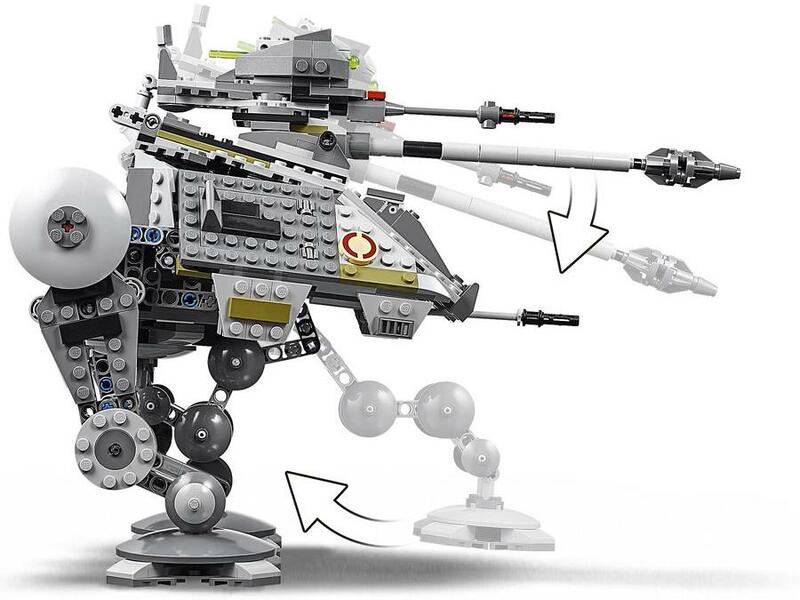 The build is a Droid Gunship, with a grey and dark blue color scheme that is unmistakably Separatist. It has benefitted from some newer LEGO pieces and I like the general shaping, but it looks a bit small to me, especially compared to the minifigures and the price point. There is an opening cockpit and you can put a battle droid inside to pilot it, but the gunship will look just fine even without a pilot. This is still a welcome feature though. The gunship is equipped with eight flick-fire missiles and two stud shooters on its underside, but other than that there’s no other play feature. This is pretty disappointing as mere flick-fire missiles and stud shooters are quite boring. Even spring-loaded shooters would have been better. I know that the in-universe craft only has missiles underneath, but there are fourteen missiles on the in-universe craft and having just flick-fire missiles feels a bit boring to me. Overall, I think this LEGO Star Wars 2019 set is rather disappointing. The build looks decent but seems quite small, while the minifigure selection and playability is rather weak. Furthermore, if the price is in fact $49.99 USD, then the value front is also lacking, making for a weak set overall. 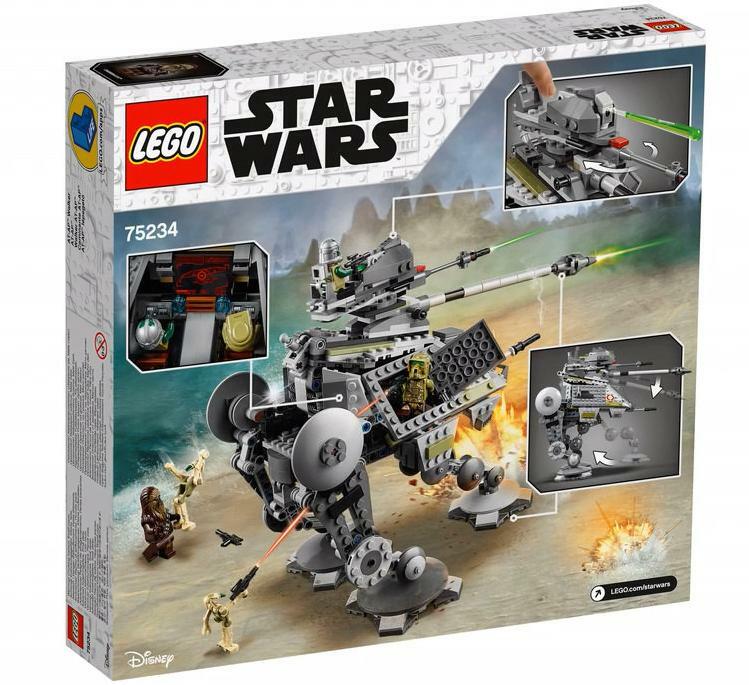 Next up, we have 75234 AT-AP Walker, a 689-piece set that I am guessing will retail for $59.99 USD. 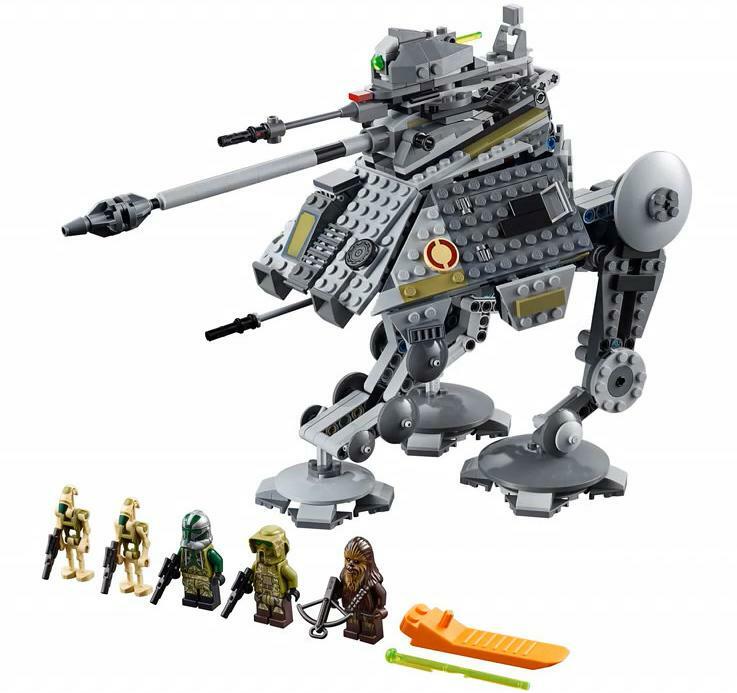 It comes with five minifigures – Chewbacca, a 41st Elite Corps Kashyyyk Scout Trooper, Commander Gree, and two Kashyyyk Battle Droids. Chewbacca, the Scout Trooper, and Commander Gree are all recycled from their 2014 set appearances which is pretty disappointing, but then again seeing how LEGO butchered the updated stormtrooper maybe it’s better for them to stick with these older figures. I do like the camouflage printing on Gree and the Scout Trooper but it would have been nice to get new minifigs. 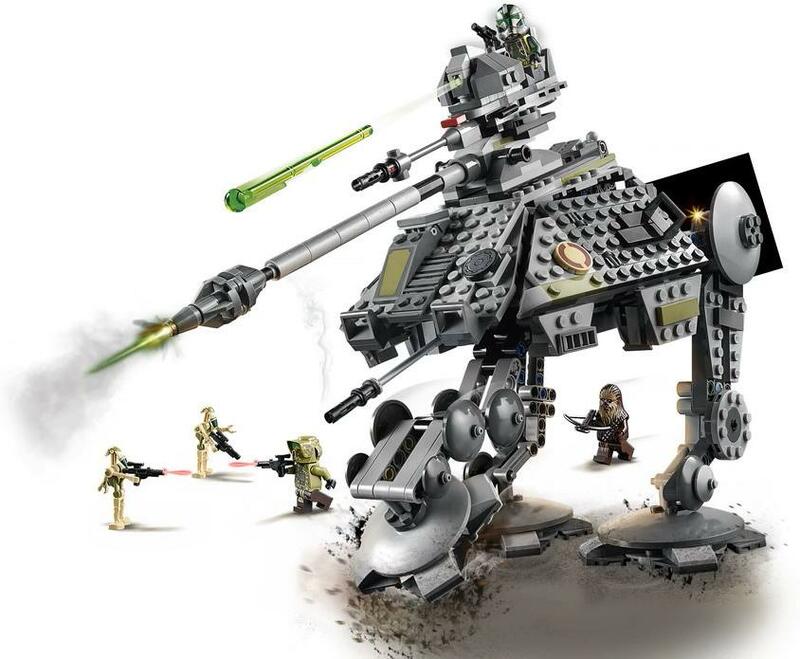 The Kashyyyk Battle Droids are the same as the ones in 75233 but they’re not too special in my opinion. 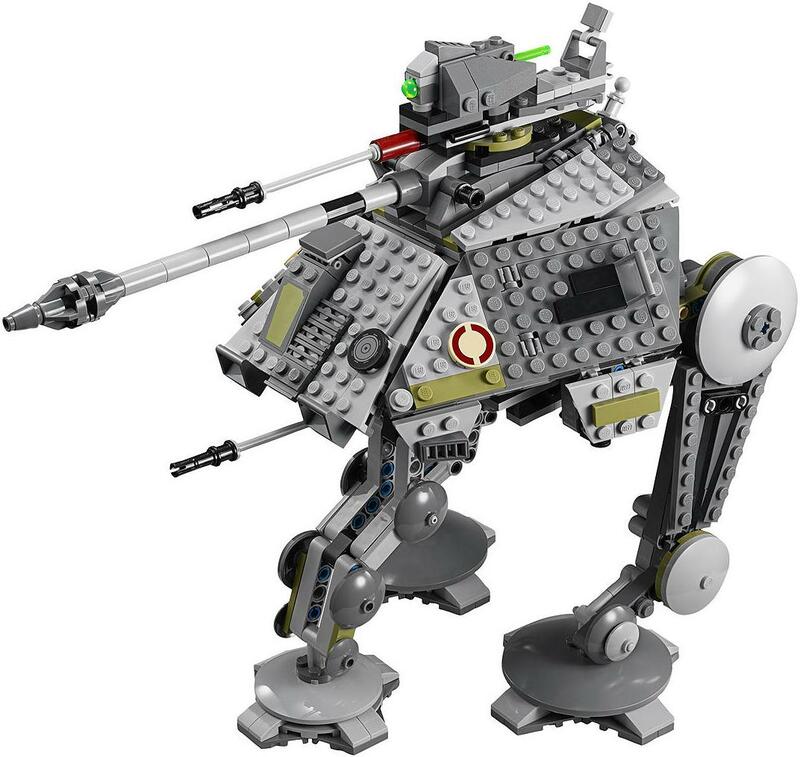 There is only build included in the set, which is the AT-AP Walker. I must say that the 2018 AT-AP looks really, really similar to the 2014 AT-AP Walker – almost eerily similar. It’s really weird! 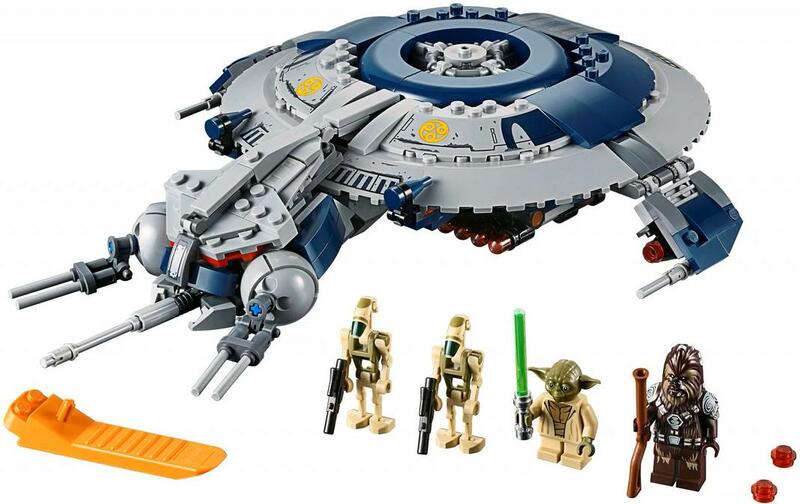 And a bit disappointing too – why would LEGO bother redoing this set if they’re barely going to update it? The opening panels on either side are still present, just like on the 204 version. I mean, the only visible updates to the AT-AP (from what I can tell) is that the back is closed up a bit better, but then the top is not closed as well and ends up looking gappier. The legs have been changed but honestly I think the 2014 AT-AP’s legs actually looked better. It has the retractable third leg (just like the previous versions) but now the top cannon can move up and down – I don’t think the previous one could do this, so this is an improvement. The smaller top cannon can also rotate side-to-side. It has a translucent green spring-loaded shooter and a seat for Gree – just like the 2014 version! So ultimately, this set is a bit disappointing simply because of how it seems like a rehash of the 2014 AT-AP Walker set. I might still get it since I missed out on the 2014 AT-AP set, but the apparent uncreativity of this set is a huge dampening factor. 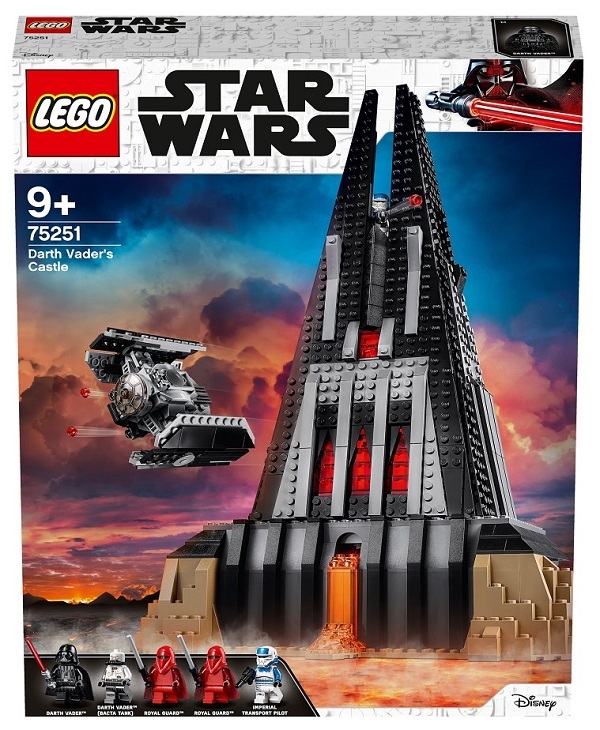 The largest set of the 2019 LEGO Star Wars wave that has been revealed so far is 75251 Darth Vader’s Castle, an Amazon exclusive that was revealed some time ago. 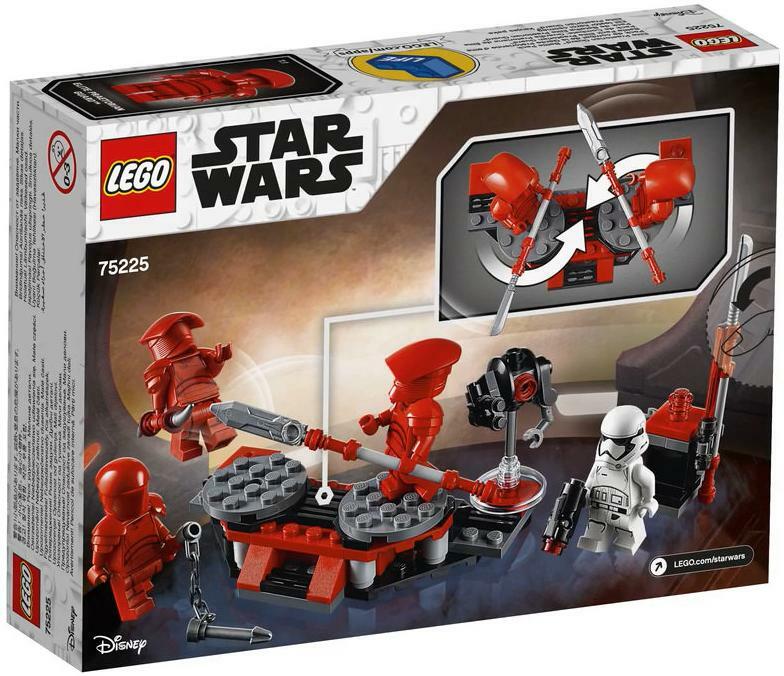 It comes with five minifigures: Royal Guard x2, Darth Vader, Imperial Transport Pilot, and Bacta Tank Darth Vader, plus a brick-built mouse droid. 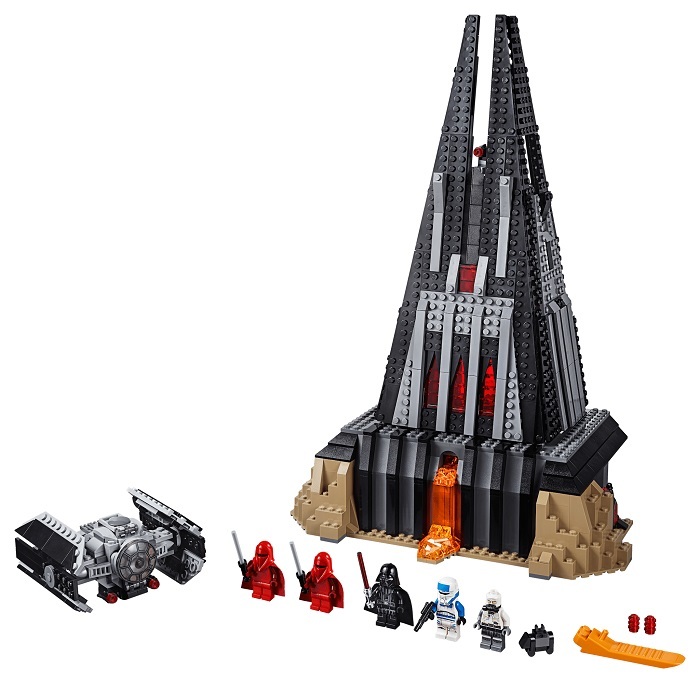 There are two builds in the set – a mini TIE Advanced for Vader, and Vader’s Mustafar castle itself. The castle has an imposing, evil look, with a black, grey, and translucent red color scheme. There is some lava flowing out of the lowest storey, reflecting the fact that this castle is set on Mustafar. 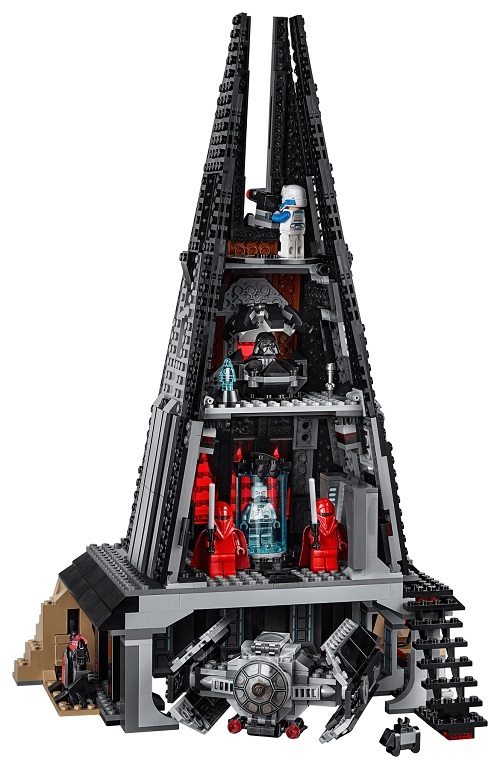 The interior of the castle has many rooms, including a secret Sith holocron cave, a basement hangar for the TIE Advanced, a Bacta Tank chamber for Darth Vader, a meditation pod room for Vader with a Palpatine hologram, and a cannon turret at the top. 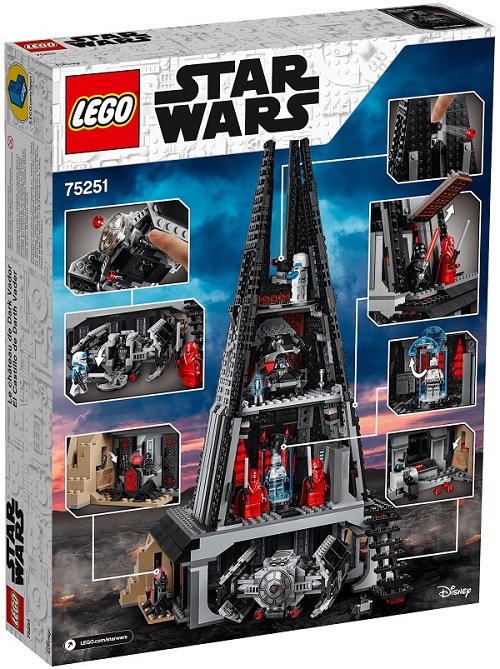 Overall, this set looks pretty cool and should be fun for any Vader fans (wink wink). 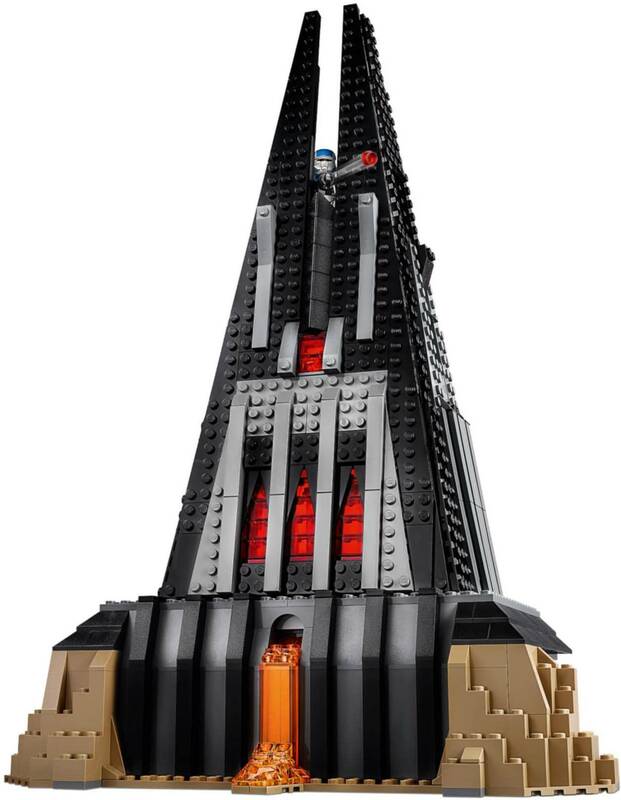 However, it is priced at $129.99 USD which feels very expensive to me, especially since the interior space of the castle is not particularly large. Furthermore, the minifigure selection is not amazing either, as Darth Vader and the two Royal Guards are existing, reused minifigures. 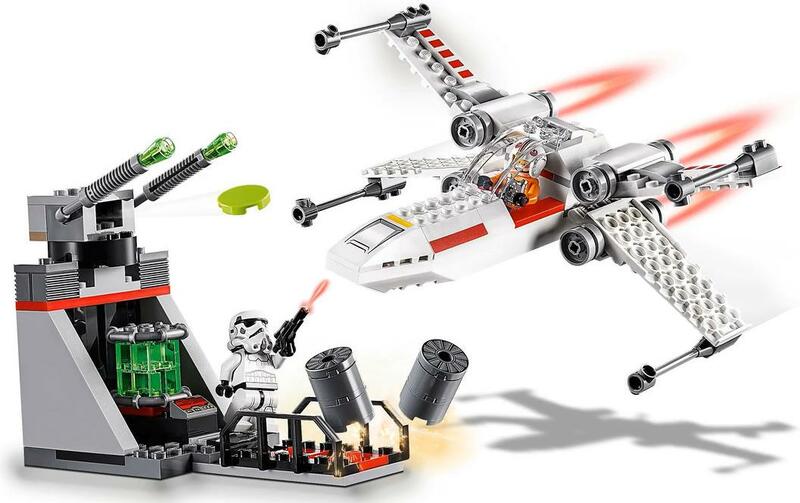 One thing new in 2019 is the introduction of 4+ LEGO Star Wars sets – basically LEGO Star Wars Juniors. 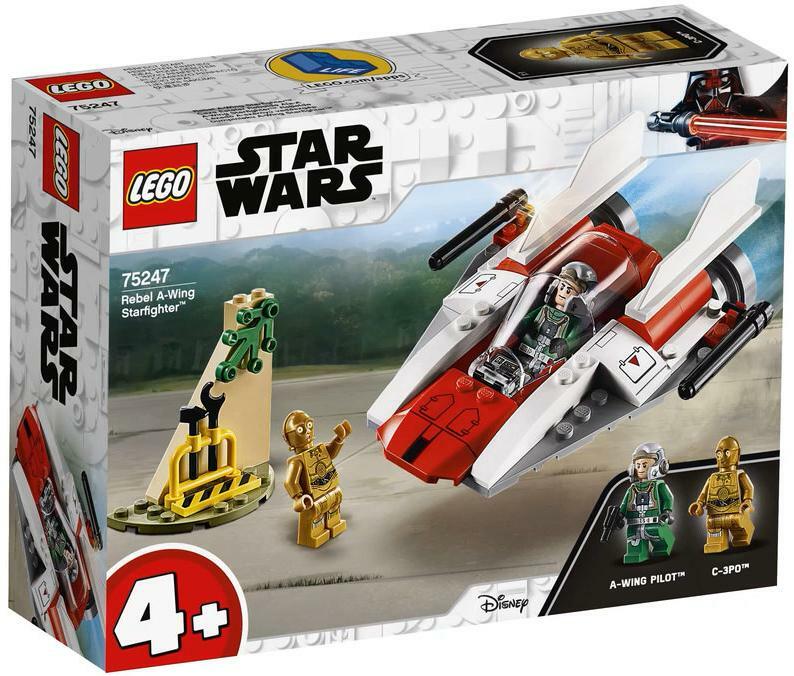 One of the sets is 75247 Rebel A-wing Starfighter, shown above. This set comes with two minifigures, though unfortunately neither of them are new. 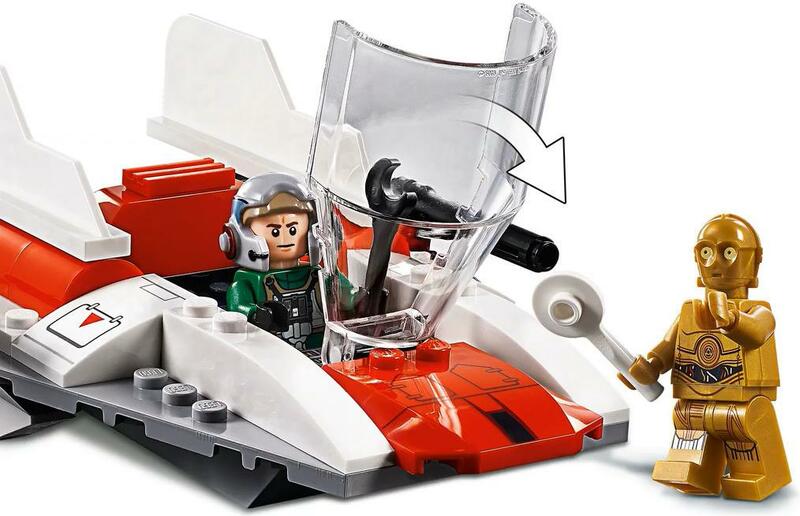 The one on the left is a Rebel A-wing Pilot, who previously appeared in the 2017 LEGO A-wing Starfighter set. He wears a bright green flight suit with a very nice, detailed helmet mold. The other minifigure is C-3PO – this is the normal version of Threepio we’ve gotten in regular sets for a while now, with decent printing on his all-golden body. There are two builds in the set – a small section of the Yavin IV Rebel Base, and the eponymous A-wing Starfighter itself. The Yavin IV Rebel Base sidebuild is really really basic, with just a sloped wall that has a leaf on it to reflect Yavin IV’s lush setting. There’s also a printed 1×4 hazard tile and a yellow tool rack with a hammer and a spanner. The A-wing itself is built in the simplified Juniors style, as this is of course a LEGO 4+ set. 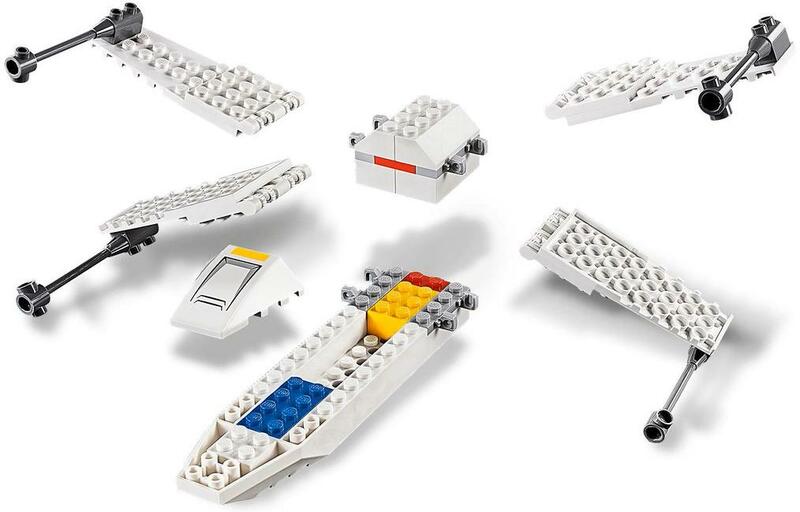 It has a one-piece light grey mold as its base, along with several big pieces that can be added to it to let younger LEGO fans build their own A-wing Starfighter. When completed, the Rebel A-wing Starfighter has an opening cockpit glass with a seat for one pilot inside. 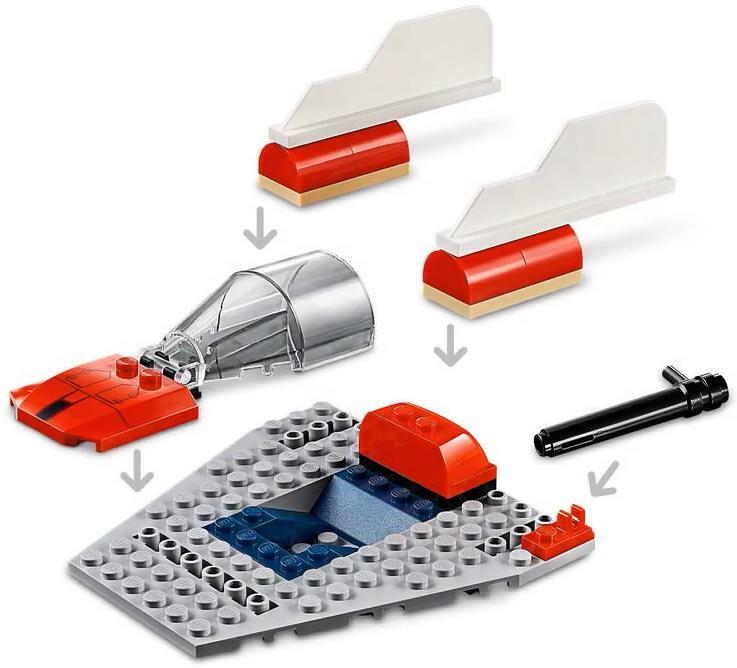 It has a white and bright red color scheme, which gives it a lighter, kiddier tone than the dark red color of regular LEGO A-wings. 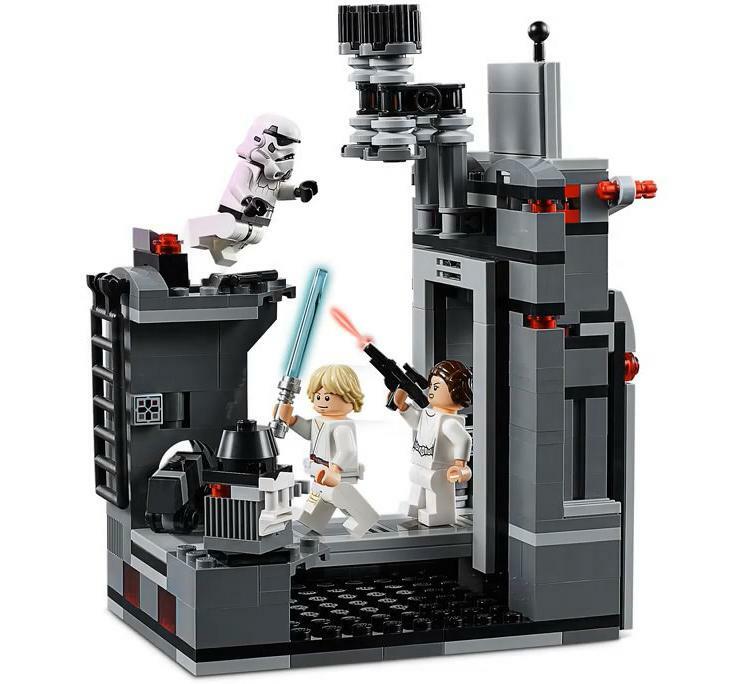 Ultimately I suppose this is an okay LEGO 4+ Star Wars set, but I don’t really see the point of these 4+ Star Wars sets. 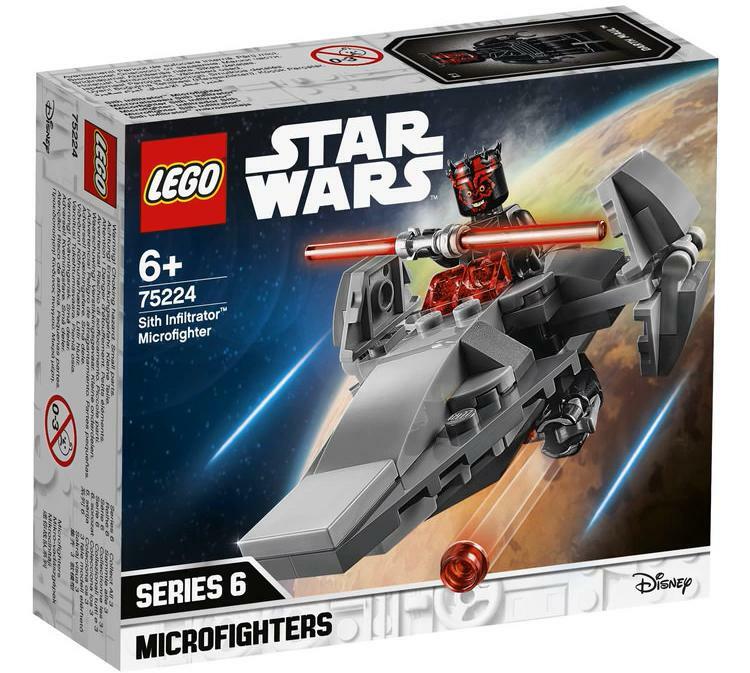 I mean, aren’t microfighters already kind of simple and aimed at a younger target audience? I get that those have smaller pieces but these aren’t devoid of small pieces either – I just don’t really see the point. The builds in this set also don’t look that good to me either – the A-wing really suffers from the use of the big parts, with strange proportions and an unfinished final look. I don’t know – I know I’m not the target audience – but I am not a fan of this set. 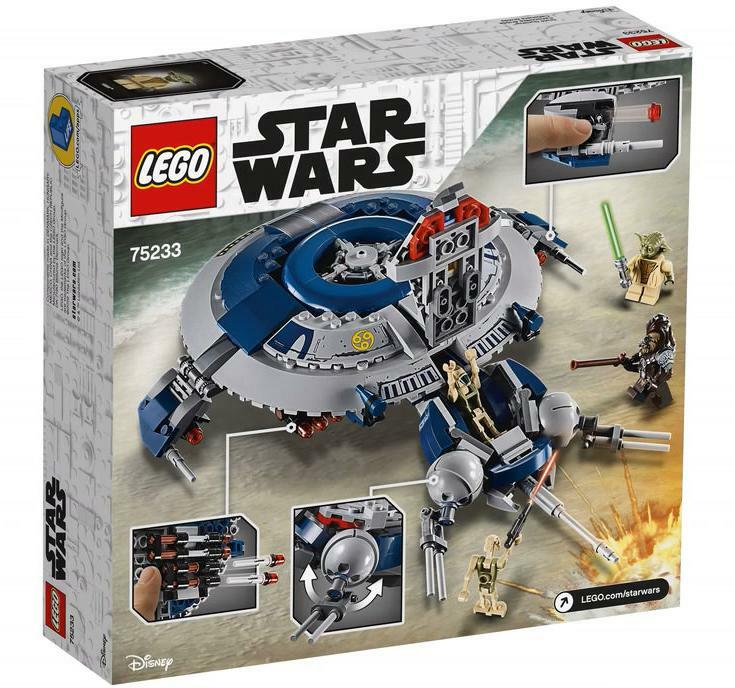 We also have 75237 TIE Fighter Attack, a slightly larger LEGO 4+ Star Wars set. 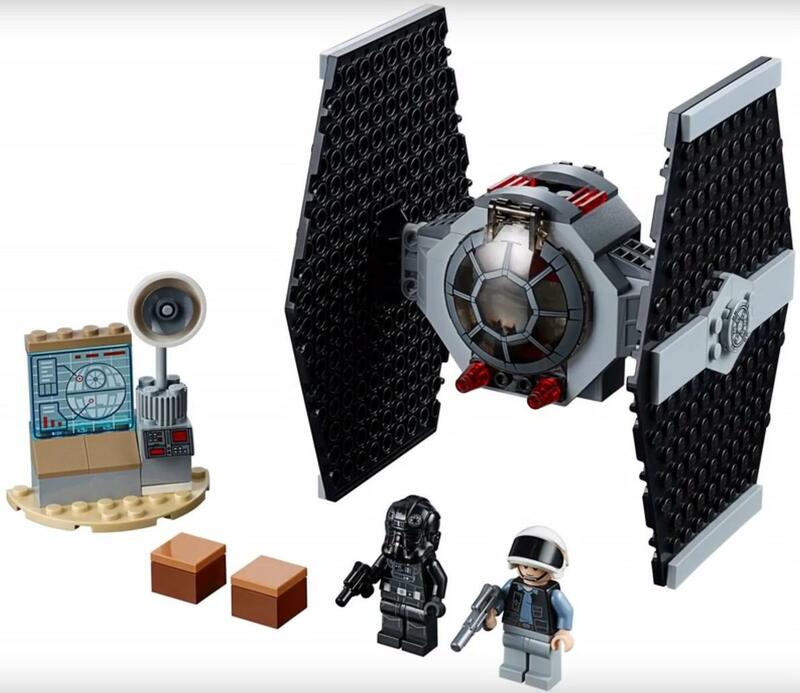 It comes with two great figures – a TIE Fighter Pilot and a Rebel Fleet Trooper. We haven’t gotten a Rebel Fleet Trooper minifigure in quite some time so getting one again is awesome – it’s just a shame it came in this set. 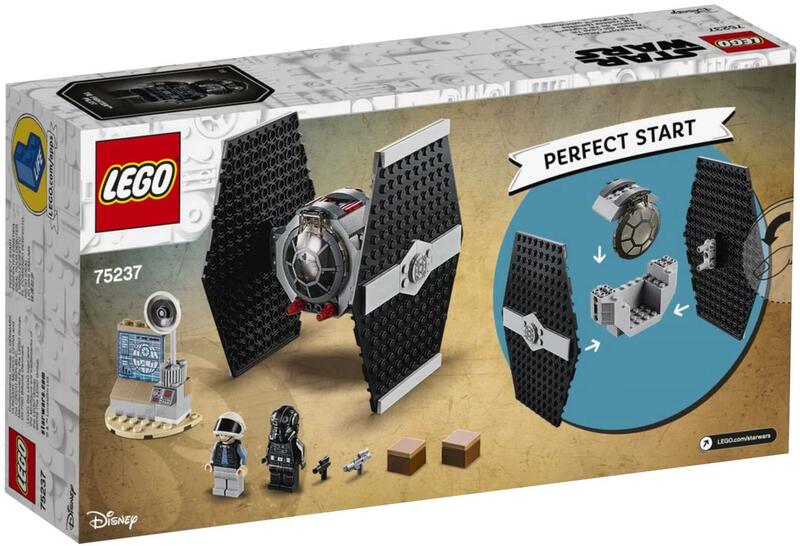 It has two builds – a TIE Fighter and a Rebel Command Center. I must admit that the printed panel with the Death Star infographic is pretty darn awesome. 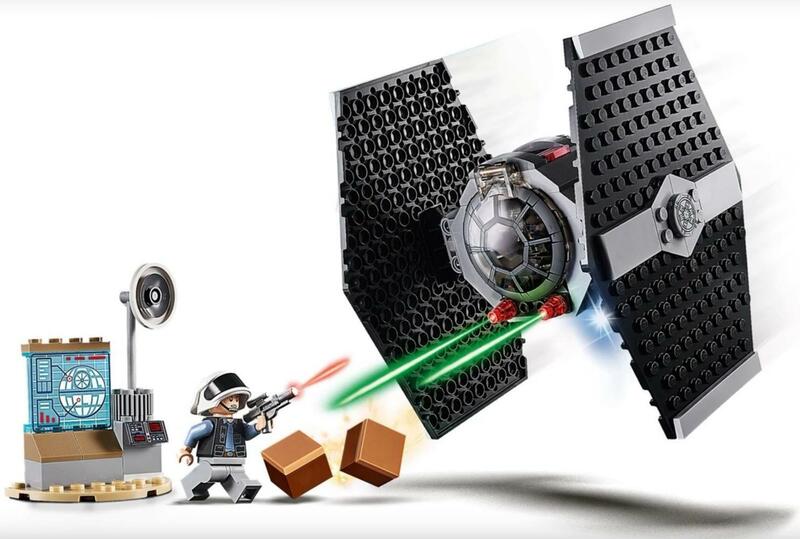 The TIE Fighter though… what the heck? 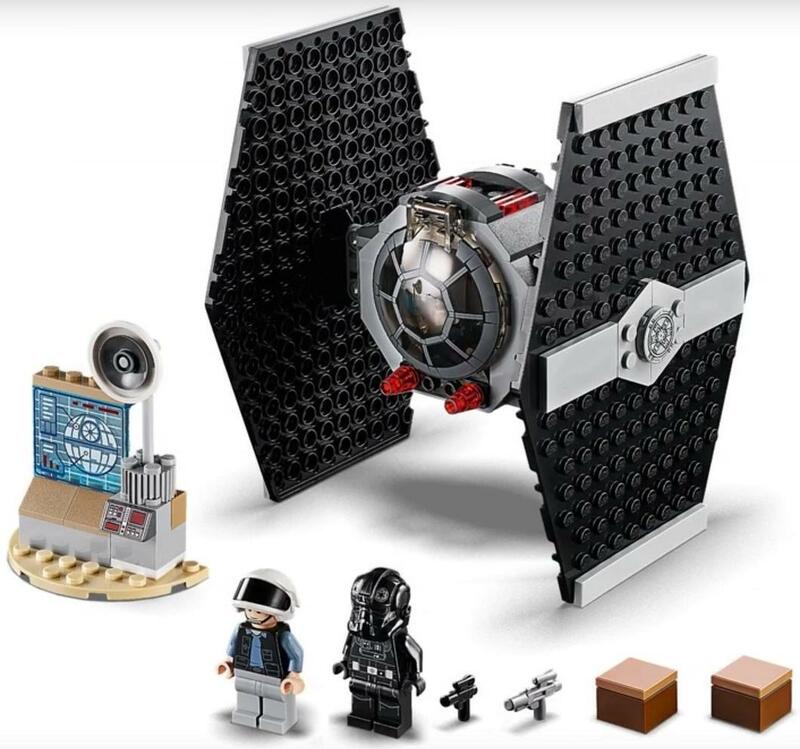 If you’re releasing a LEGO TIE Fighter, why would you make the main body largely one piece and the wings being one piece each? What’s the point? It makes for such a simplified building experience that it might as well not be a LEGO set. 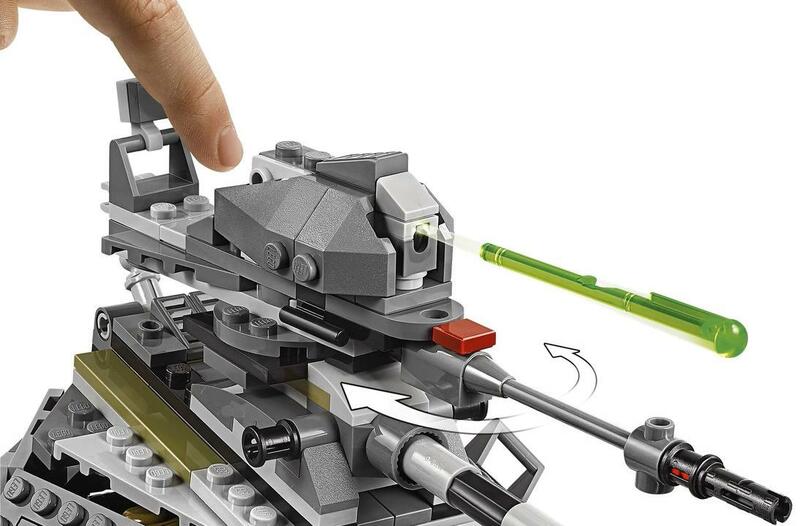 It doesn’t even shoot missiles or anything – just make-believe pew pew lasers. 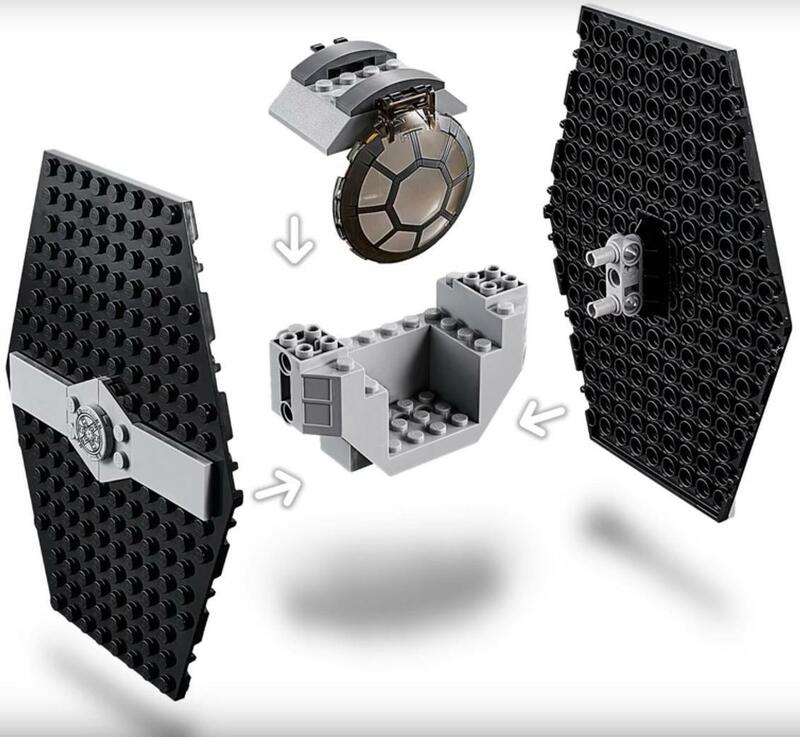 And that’s fine – but then what separates it from a normal plastic TIE Fighter toy? So yeah, not a fan of this set. If you want the rebel fleet trooper, maybe order it online off Bricklink. 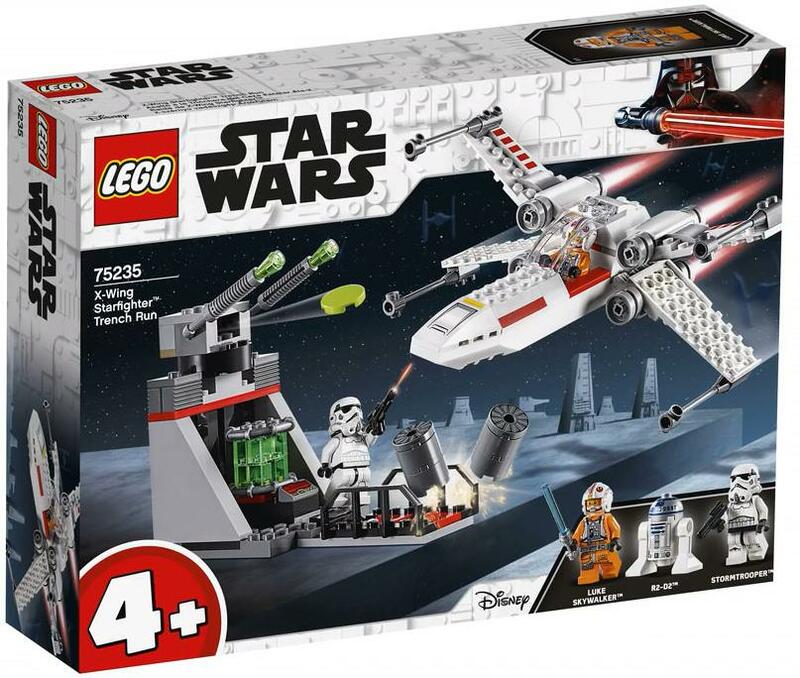 Last up, we have 75235 X-wing Starfighter Trench Run, which is a Juniors (now called 4+) set that will be released in 2019. 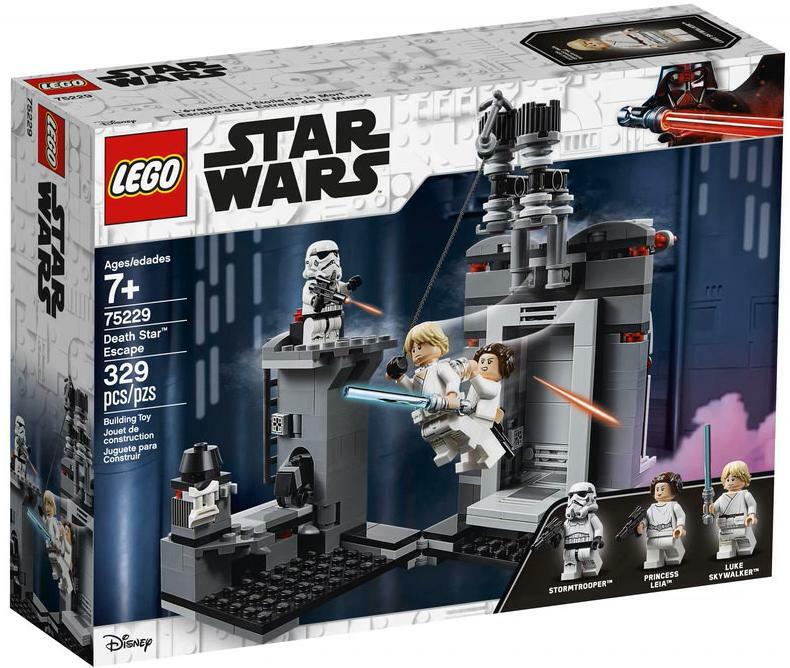 There are three minifigures included – X-wing Pilot Luke Skywalker, R2-D2, and that ugly new Stormtrooper minifigure. Luke comes with his blue lightsaber, while the stormtrooper gets a regular black blaster. 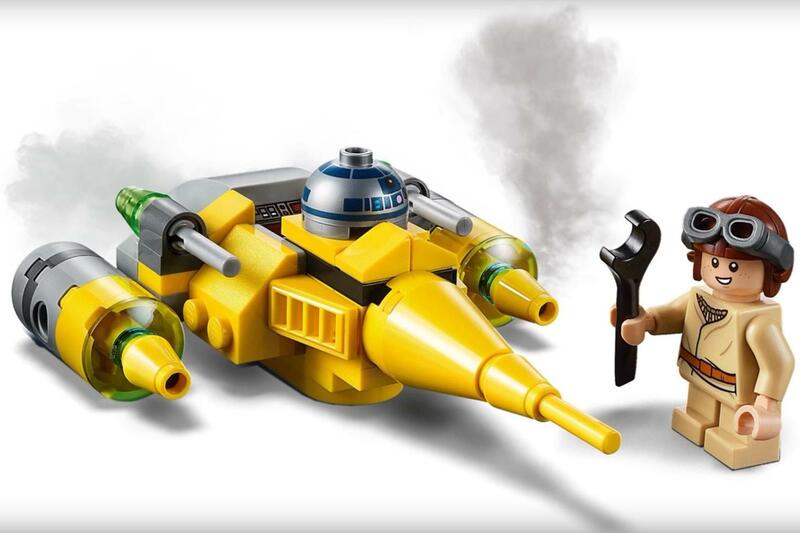 There are also two builds included in the set – an X-wing Starfighter and a Death Star Trench cannon turret. Both of these are, of course, juniorised, as this is a 4+ set. The X-wing has a large one-piece mold for the base, but other than that it doesn’t seem to use any specialised parts – just larger bricks in general. The cockpit can be opened and there is space for Luke Skywalker inside, though interestingly there is no astromech droid slot for R2-D2 (presumably due to the size limitation). I am actually pleasantly surprised by the final look of the X-wing, as despite its juniorisation I think it still looks decent – definitely not as bad as the A-wing. 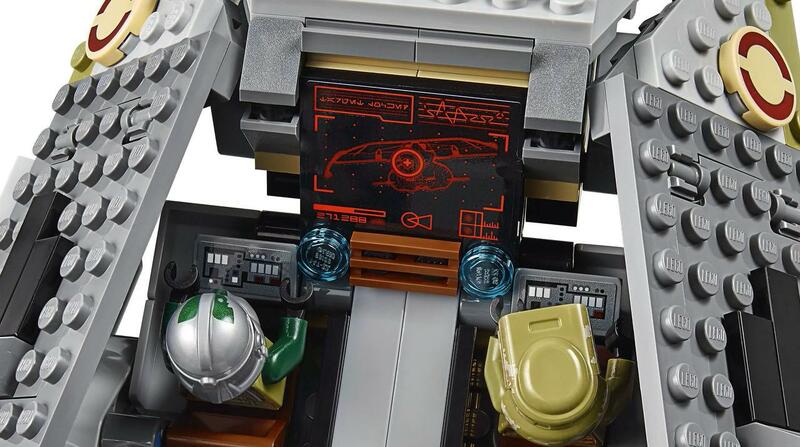 I also like the use of the curved windscreen piece for the cockpit glass, as it is a piece that is not often used for ships in the LEGO Star Wars universe. The Death Star turret has a grey color scheme, matching the actual Death Star itself. A pair of large grey slope pieces to reflect the Death Star cannons’ sloping body. There is a rotating cannon on the top with two hinged cannon barrels and a disc shooter. The disc shooter fires off lime green 2×2 round plates, though I’m surprised LEGO included a disc shooter in a 4+ set as those disc shooters can be pretty powerful. There’s also a walkway and a bit of interior detail on the cannon – there’s a translucent green core that can be detached, along with a printed 1×2 console slope. There are also two barrels that can be knocked over, though the X-wing does not have any shooting parts so you can’t actually knock them down. A bit of an odd choice if you ask me. 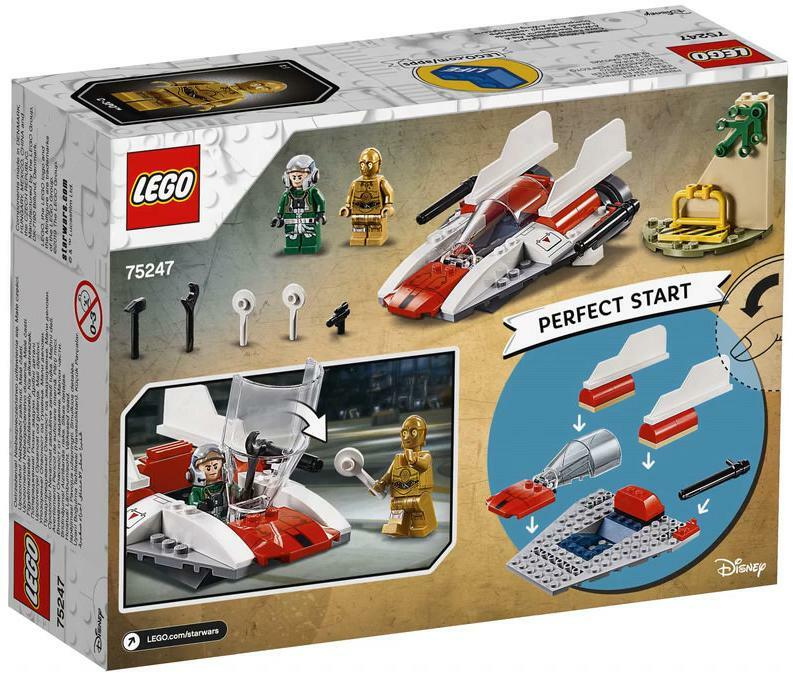 So yeah, I’m not sure of LEGO Juniors (or 4+), but I do think this 2019 LEGO Star Wars set is decent – in my opinion, it’s better than the A-wing set and much better than the TIE Fighter set. 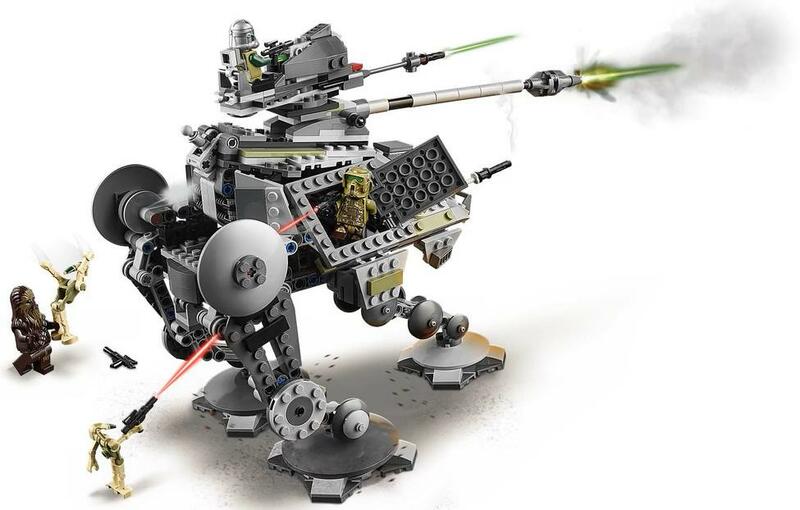 Well, that’s it for all the LEGO Star Wars 2019 sets that have been revealed so far! 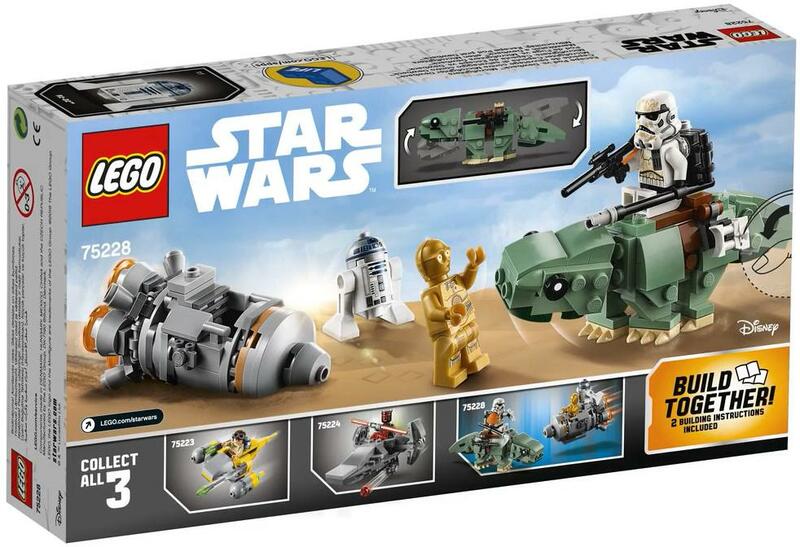 Once again, these are not all the sets that have been revealed yet – there are more sets in this wave and also more sets due in the summer, with potentially a special LEGO Star Wars 20th Anniversary wave! But that’s all for now! 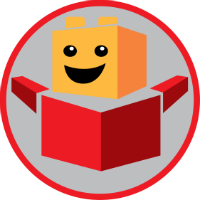 Thanks for reading – I’m VaderFan2187, and I’ll see you next time on BrickPals.com! 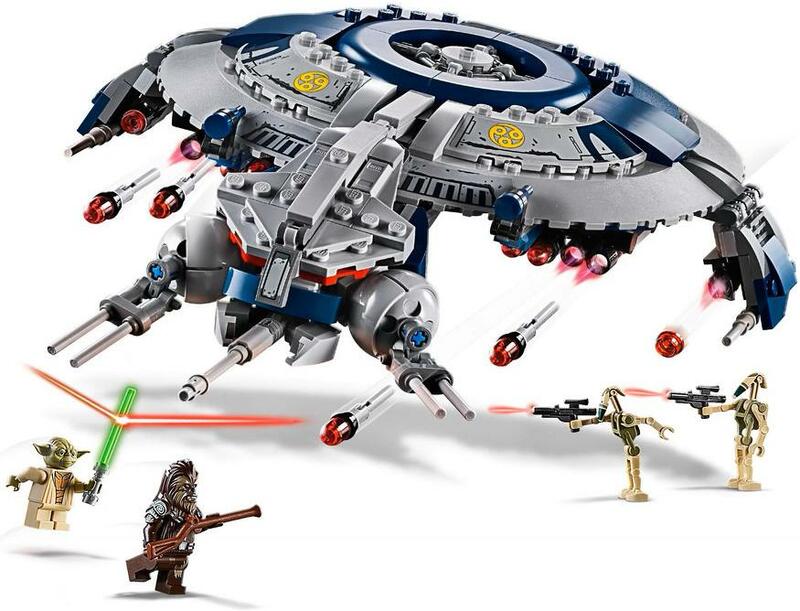 See all the latest confirmed LEGO Star Wars 2019 Sets, including; 75233 Droid Gunship, 75251 Darth Vader's Castle, 75237 TIE Fighter Attack and more!